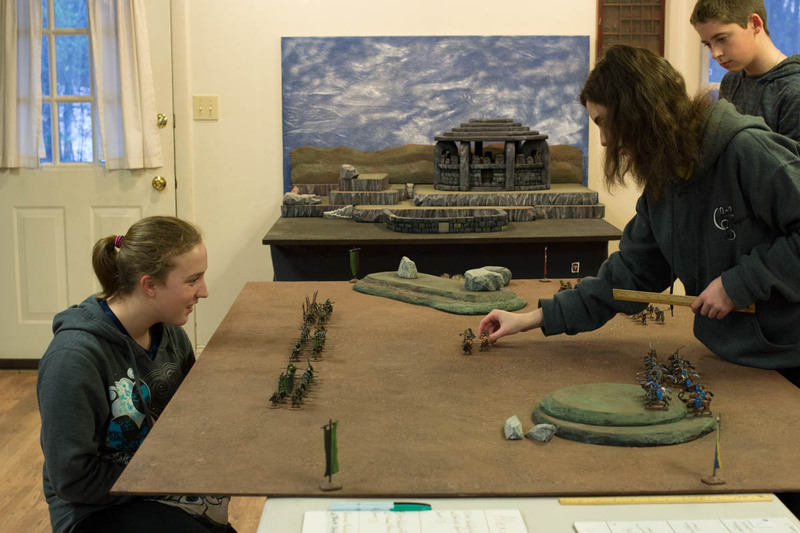 Our experienced League of Nil-ith Horn Commander took her smerdi and valdgrafs against our daughter’s Kildarian cavalry units plus unit of picked men, while the new fellow was granted 2 units of ulfhednar and a unit of berserks. 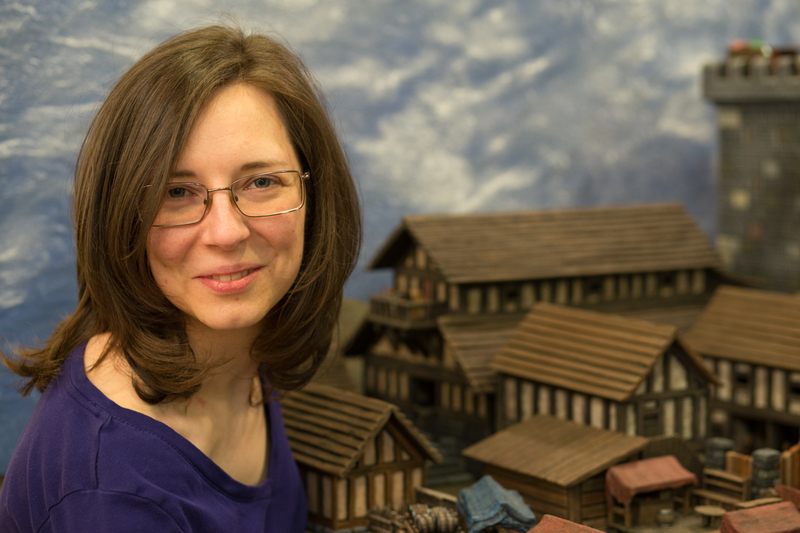 The smerdi commander stacked her units, pikes at the ready to fight from two ranks. 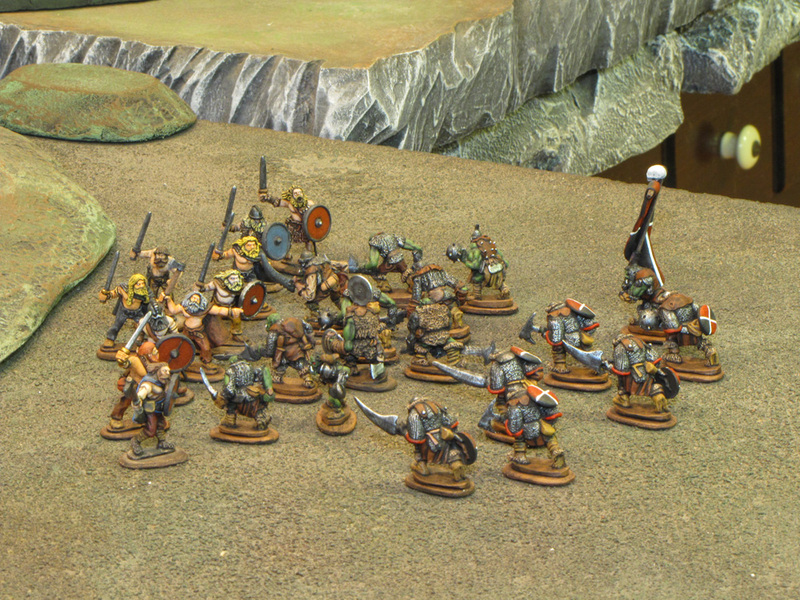 The vicious and ambitious utvalt men sprinted out to challenge them. 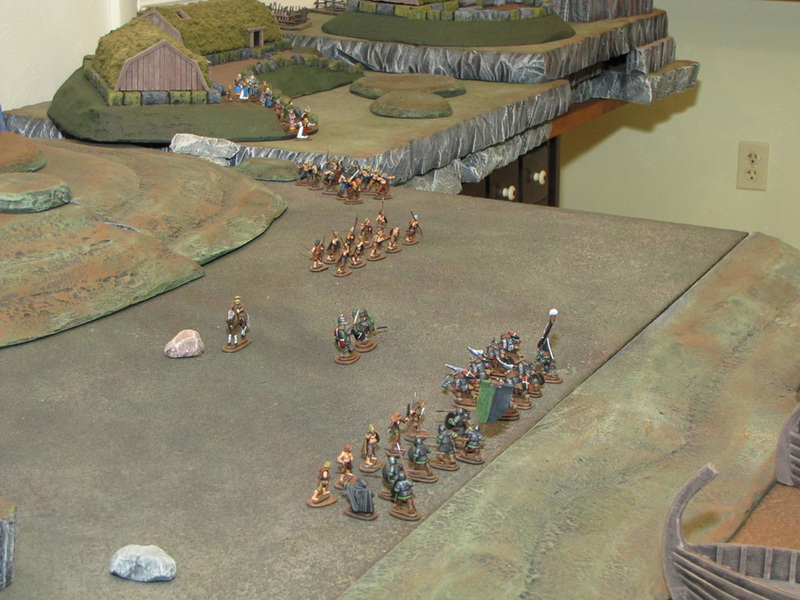 The ulfhednar raced forward to support the flank. 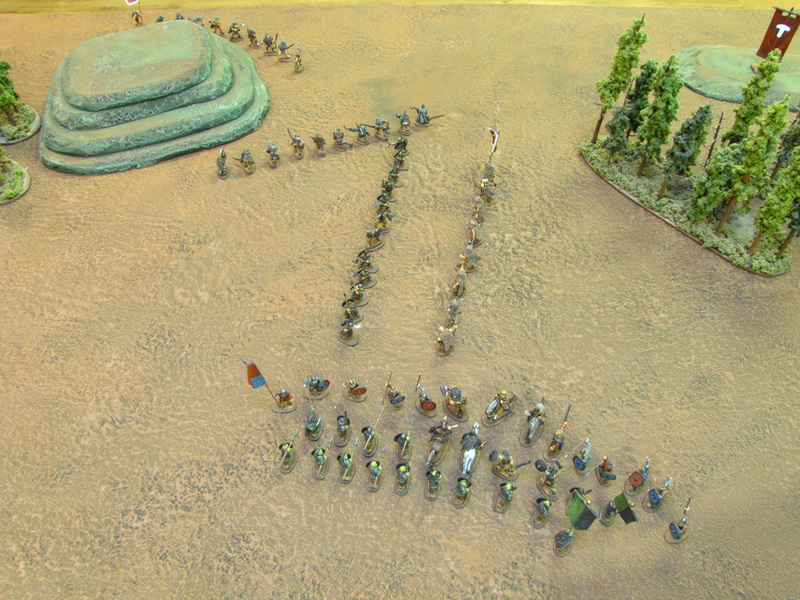 The berserk unit gained the advantage of the hill. 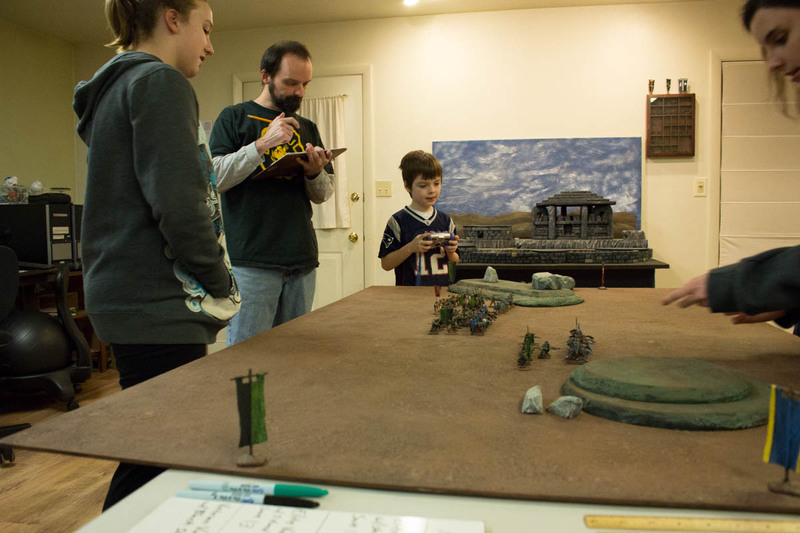 The orc commander charged across the field. 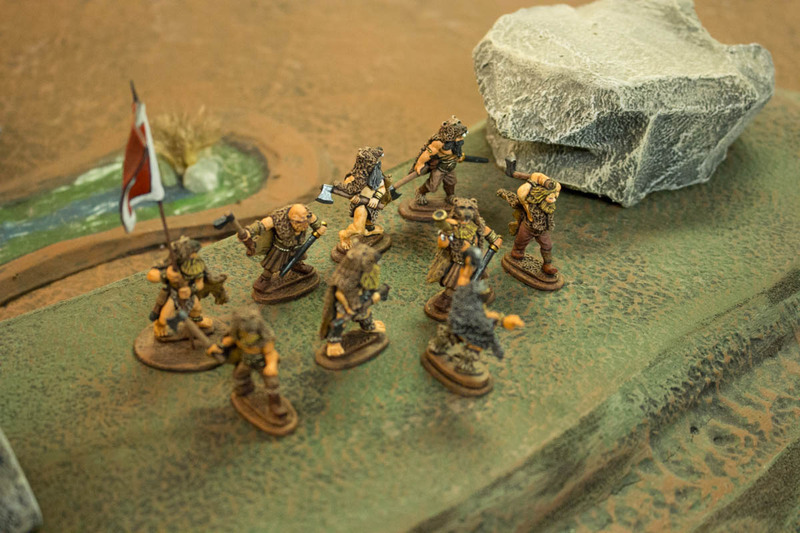 The onrushing wolf-skin-clad humans threw a storm of javelins and unexpectedly took down a few shielded orcs, then clashed in hand-to-hand combat. 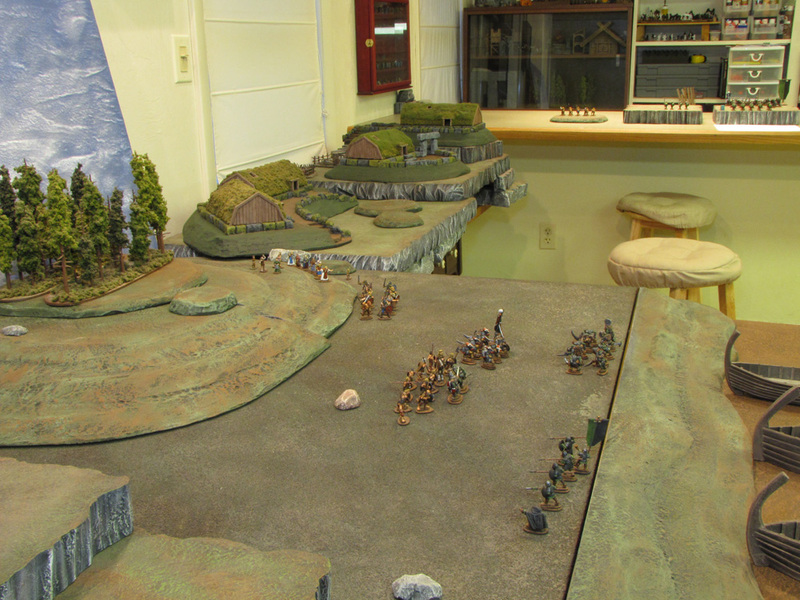 The berserks and cavalry watched from their hills. 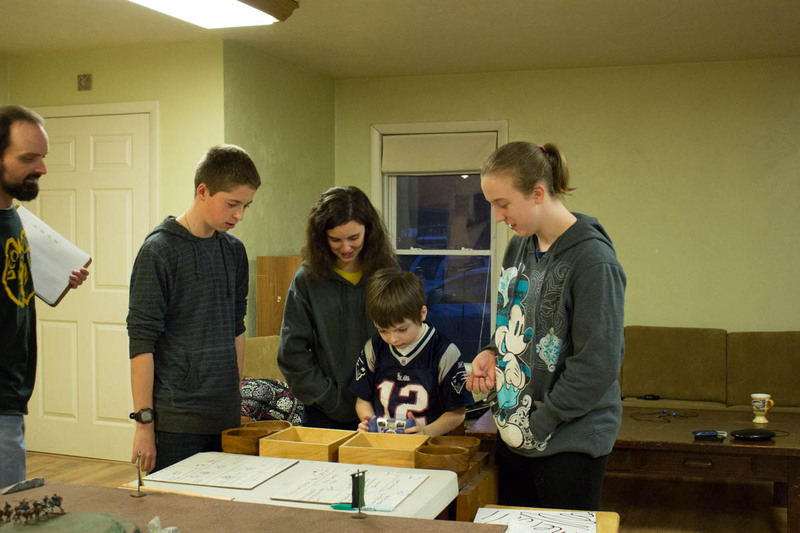 Our youngest helped me to document the swift destruction of the unshielded utvalt unit. 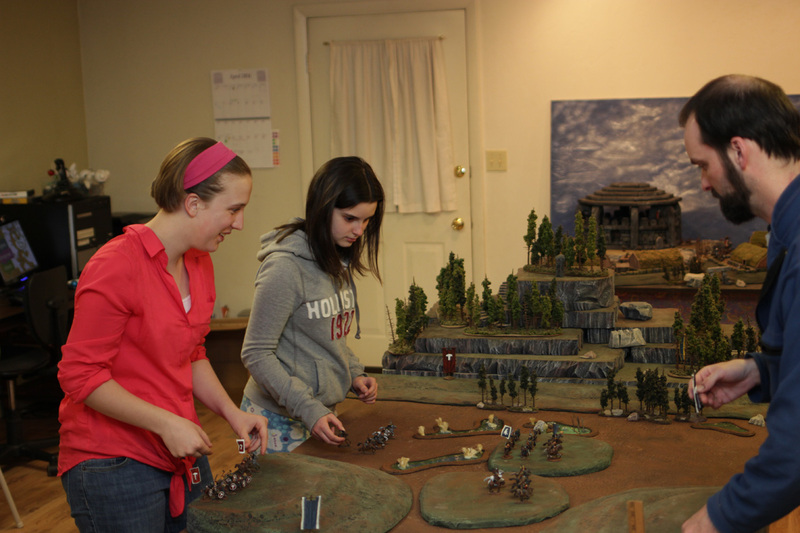 Then he joined in the dice-rolling fun on the side of the orcs. 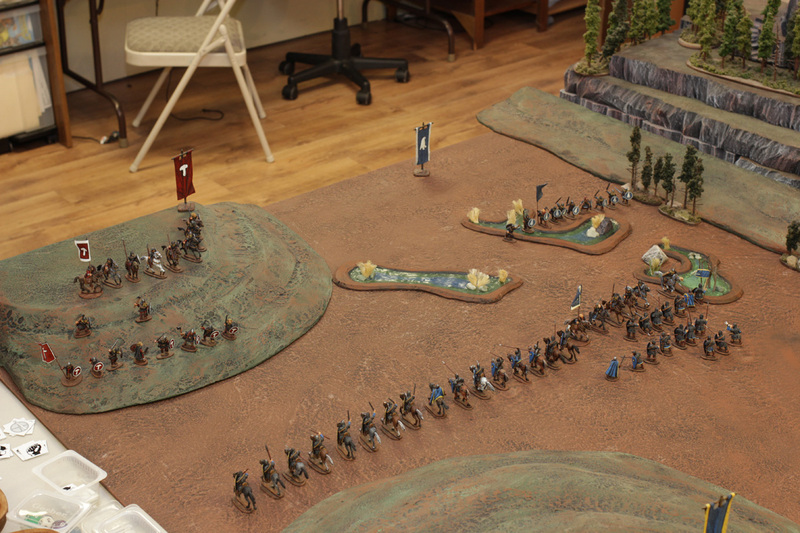 The orcs destroyed the ulfhednar, chewing through the unarmored units. 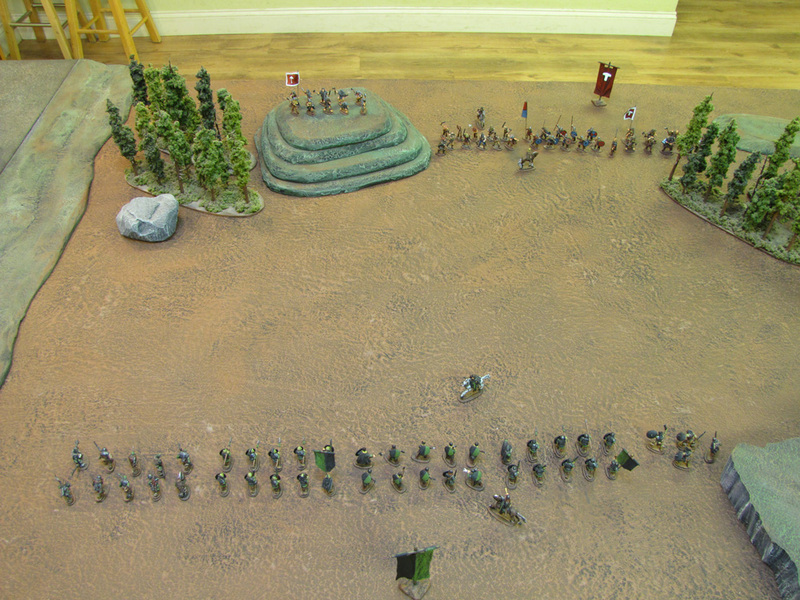 The bearskin-clad humans rushed from the hilltop into the rear of the orc formation and briefly bolstered the flank. 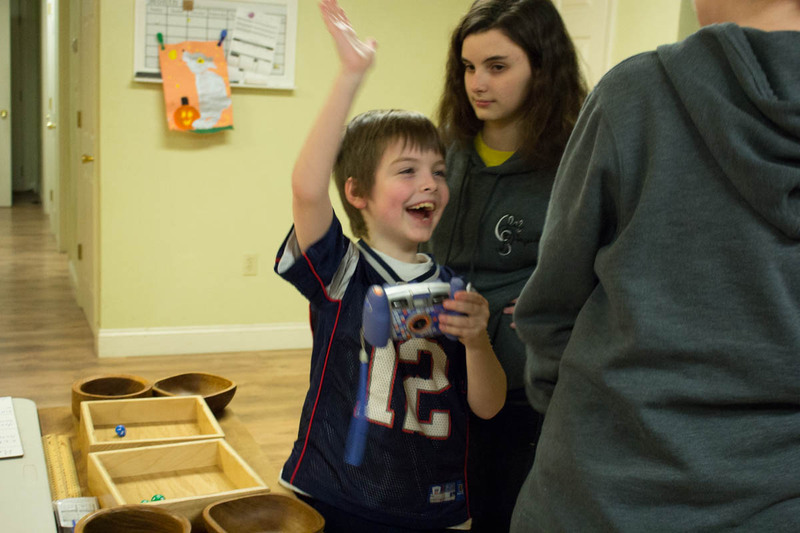 All looked lost for the humans when finally the cavalry spurred into motion. 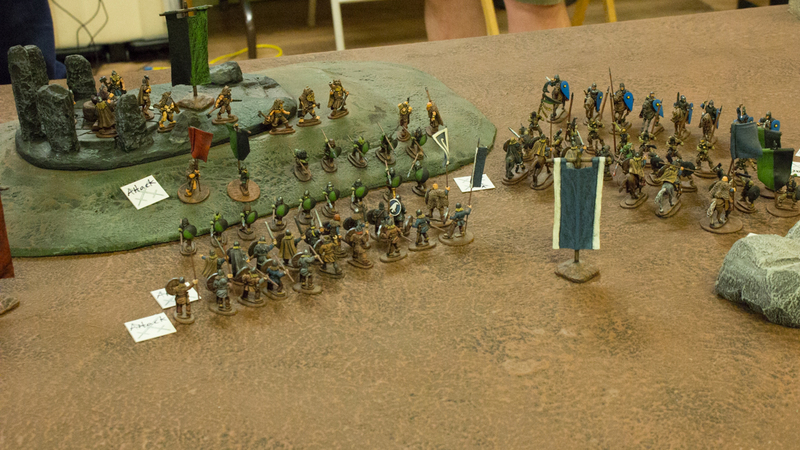 The knights charged into the ranks of orcs. 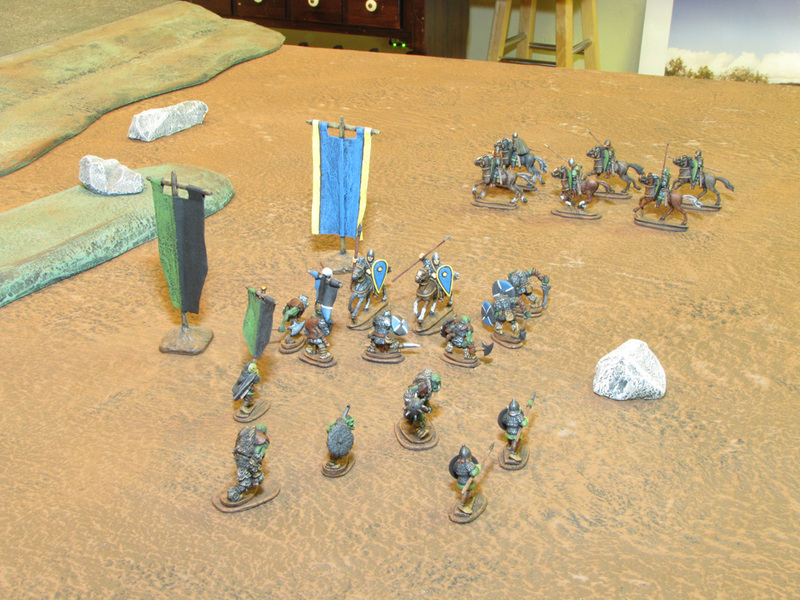 The League Orcs fought bravely, but they could not survive the onslaught from two units of heavy cavalry. 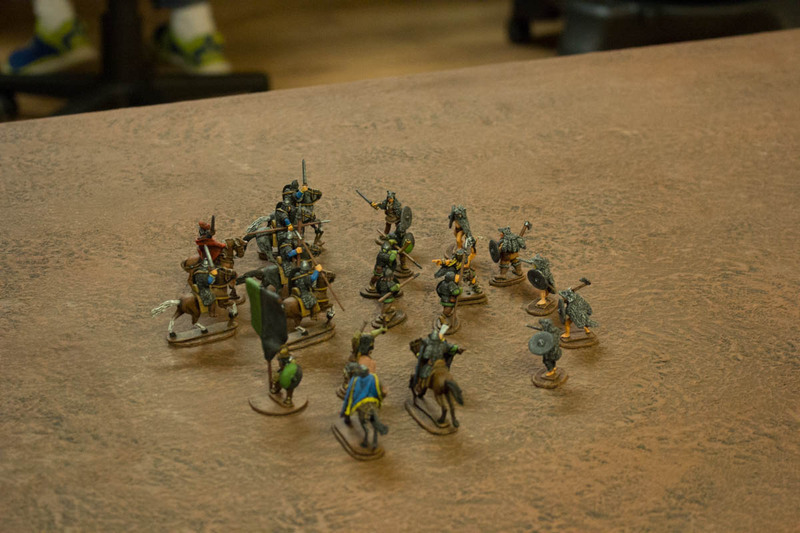 The knights and remaining infantry surrounded the League of Nil-ith Horn orcs and awarded our new-comer his first victory. 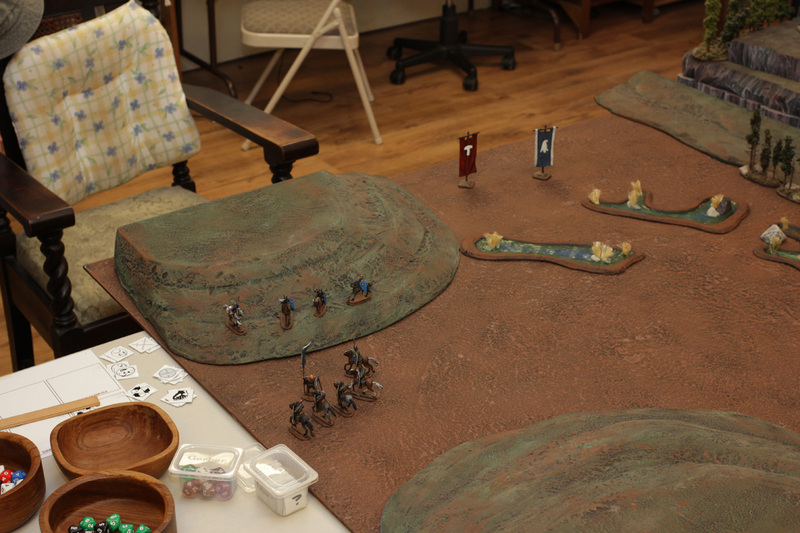 In the next Fantasy Warriors battle, 2 of our junior players fought against myself in a Gautrian (Red banners and Blue banners) versus Kildarian exercise with equal forces. 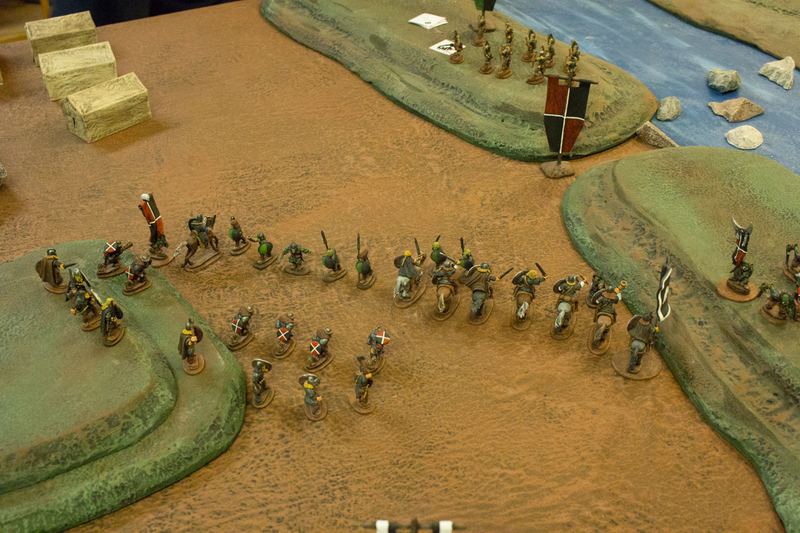 The girls each had a unit of Gautrain heavy cavalry and a unit of heavy infantry. 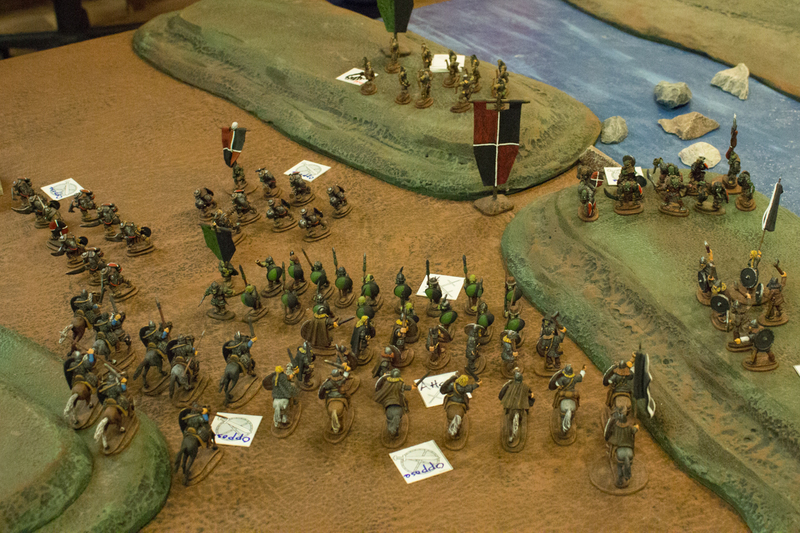 I commanded 4 units of blue-and-yellow Kildarians, 2 of cavalry and 2 of infantry. 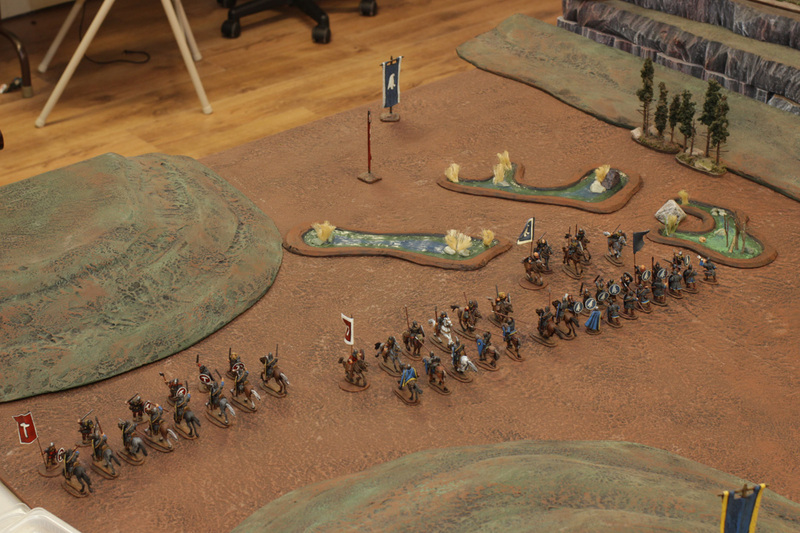 Blue put her cavalry on the attack and charged into my infantry line. 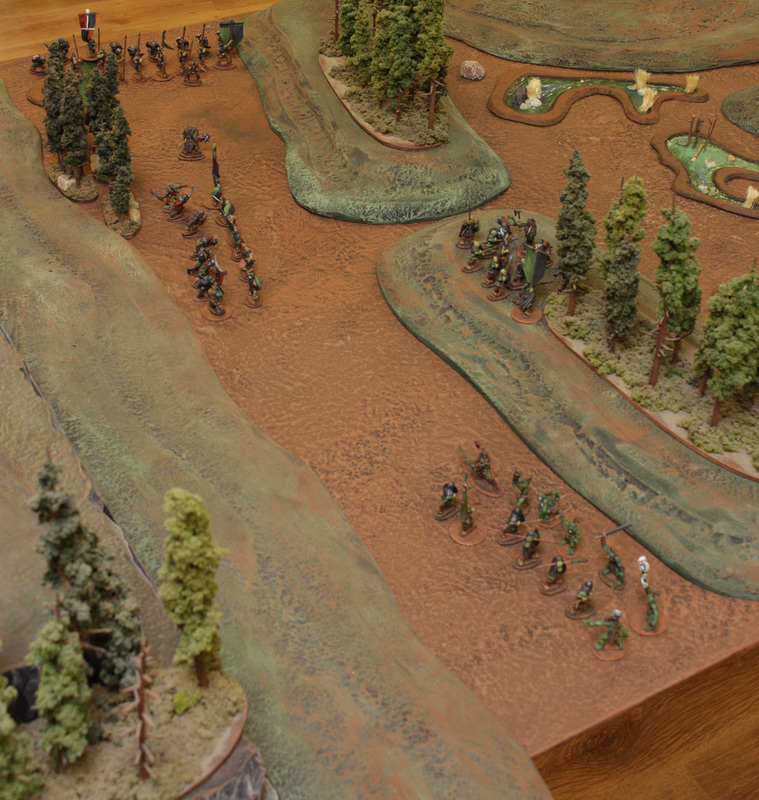 Next to them, her Gautrian infantry became mired in the swamps. 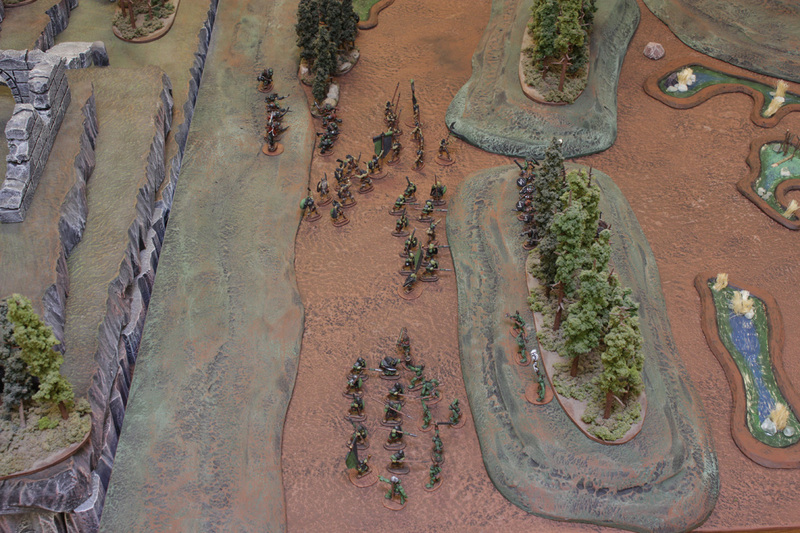 Red started the march down the hill with her infantry, while her cavalry waited to pick their target. 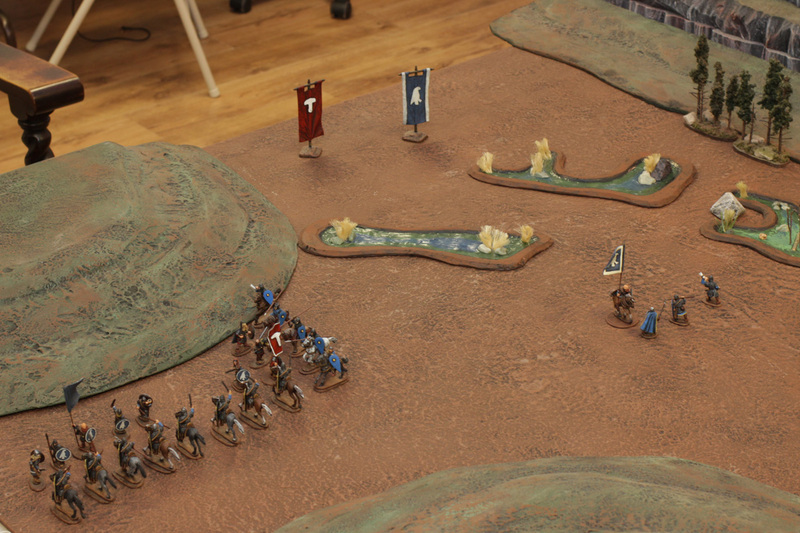 My heavy infantry and Blue’s cavalry took slight losses. 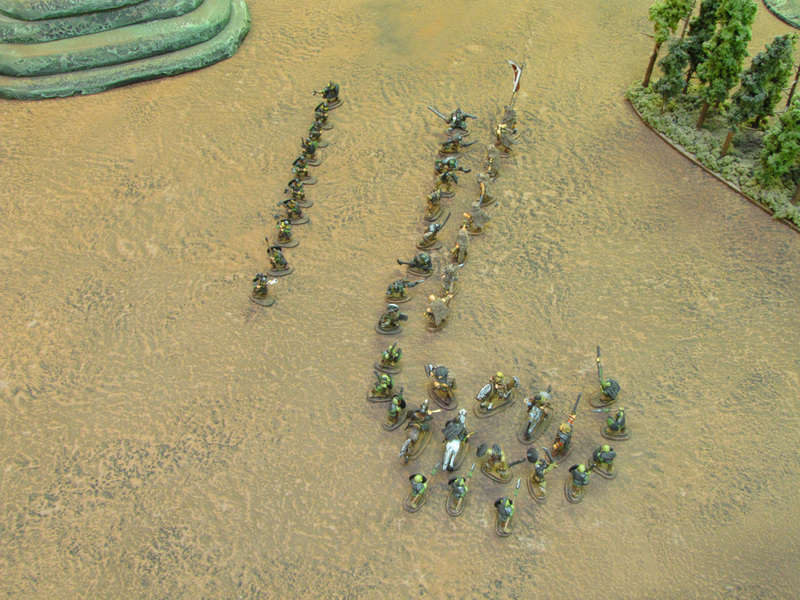 Blue’s infantry slogged through the swamp. 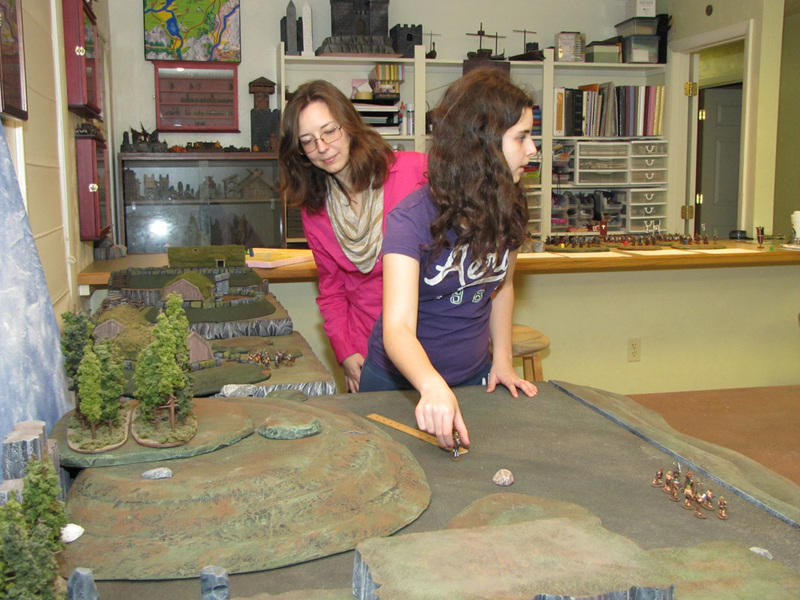 Red attacked my center cavalry with her cavalry. 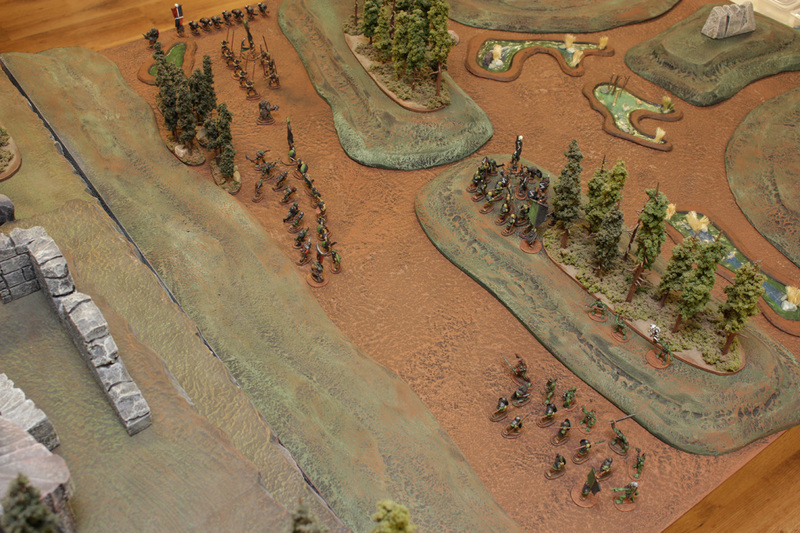 On my left flank, Red’s infantry approached my cavalry. 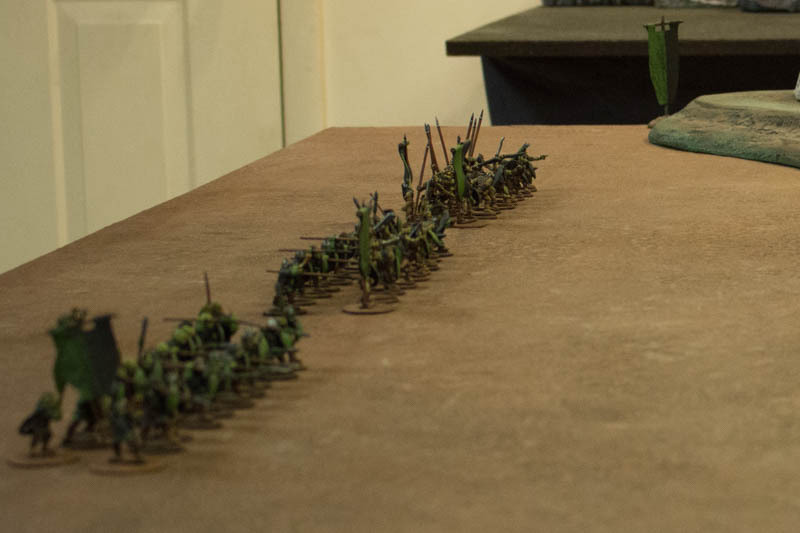 Blue’s infantry charged into the fray, displacing and disorganizing her own cavalry but decimating my first infantry unit. 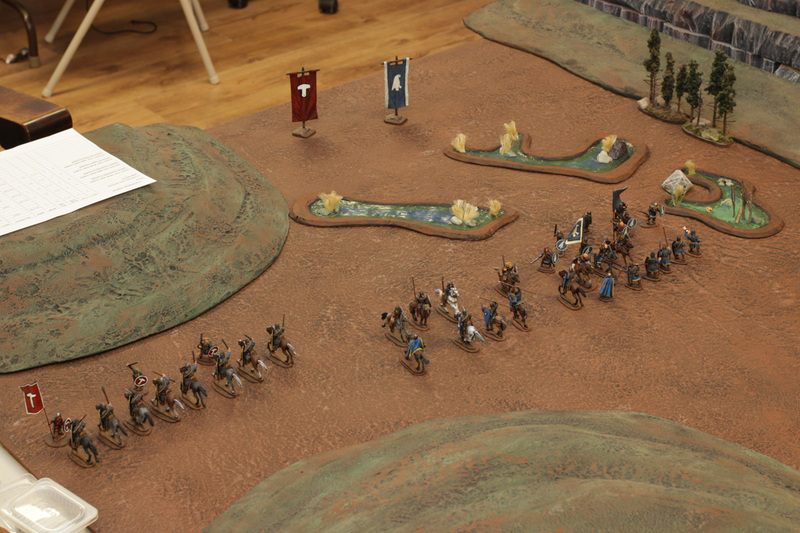 My second unit closed ranks and continued the fight as Blue’s cavalry crashed forward into the infantry. 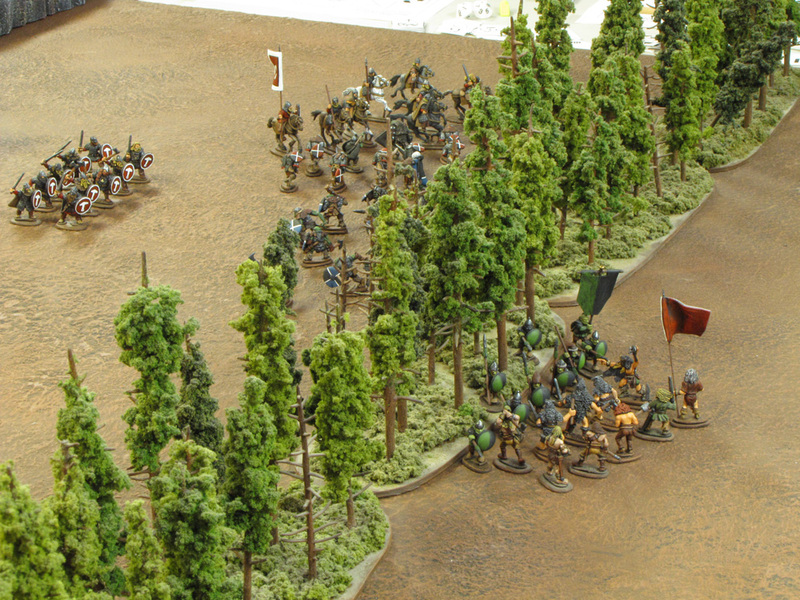 Both sides’ cavalry units in the center lost riders. 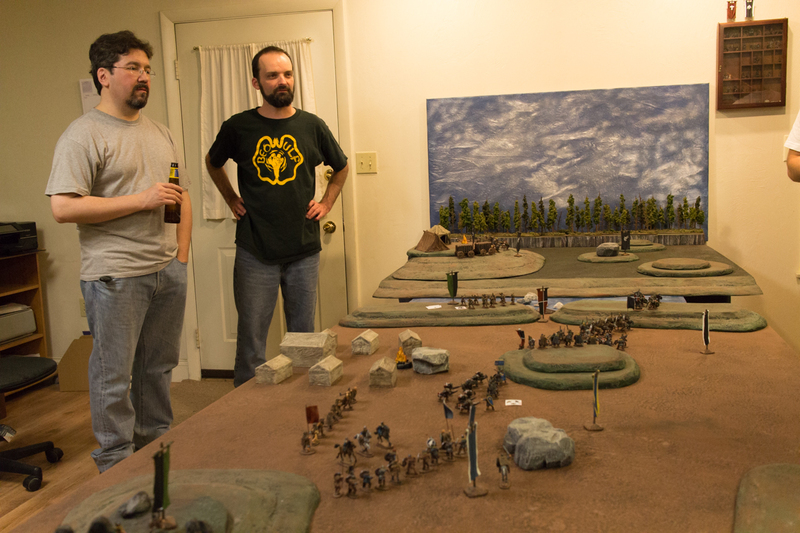 My cavalry on the left held strong and dealt many blows to Red’s infantry unit. 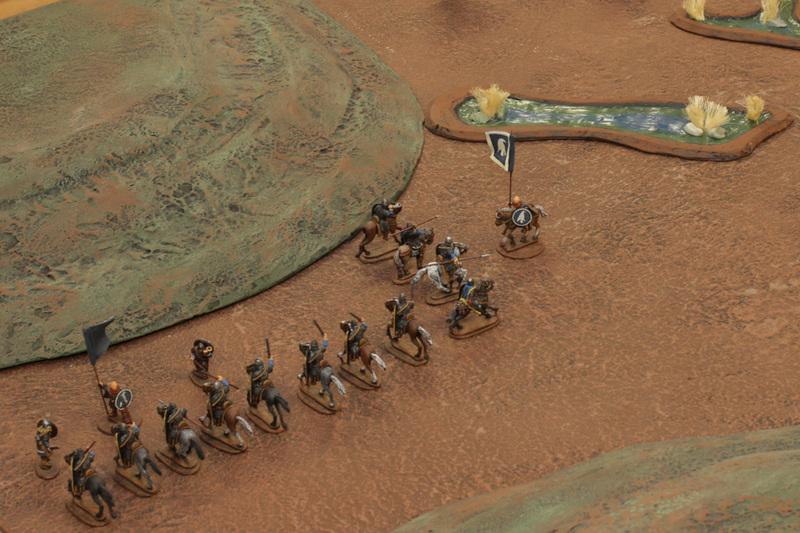 Blue’s mounted standard bearer occupied my remaining infantry. 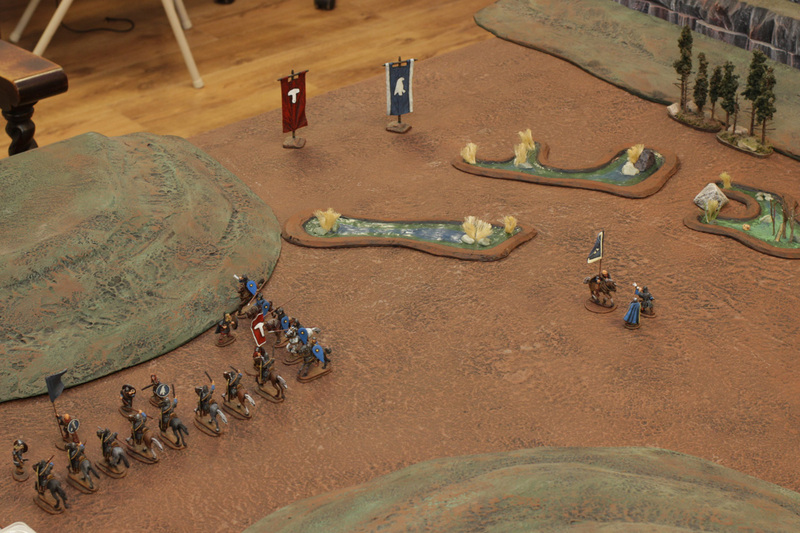 Blue Warlord got her infantry into oppose orders and pulled them across the field to bolster Red’s infantry unit. 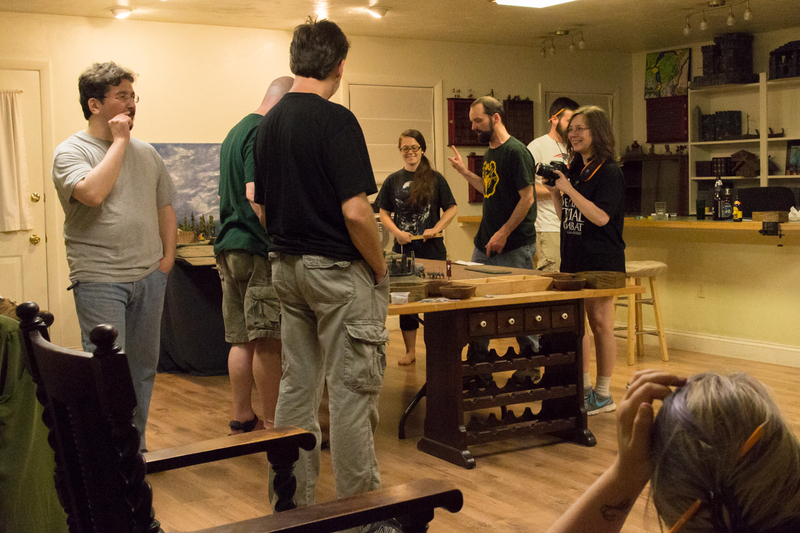 I prevailed in the center and attacked the scrum on my left. 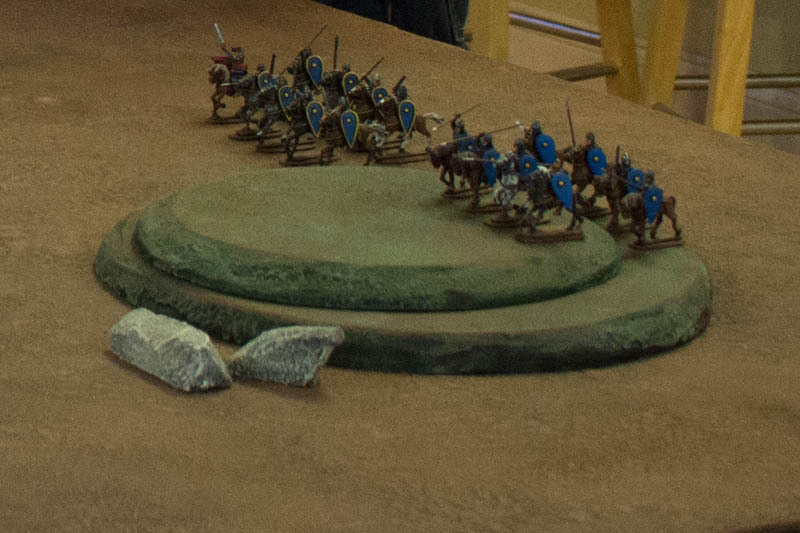 Red’s infantry fell to the swords and spears of my riders. 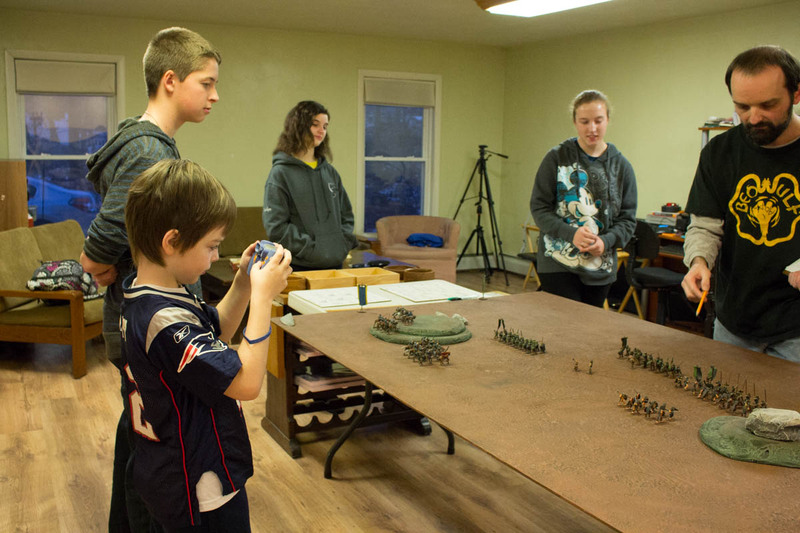 Blue’s forces fought bravely, but in the end were overcome by my cavalry. 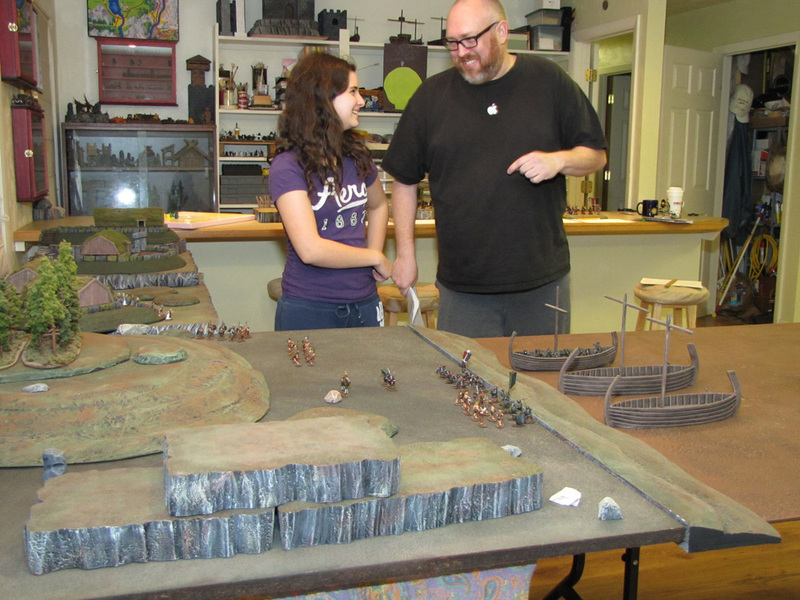 This Fantasy Warrior battle featured a father-daughter team as a League of Nil-ith Horn Orc relief force ordered to the Vangen capital of Kednvald. 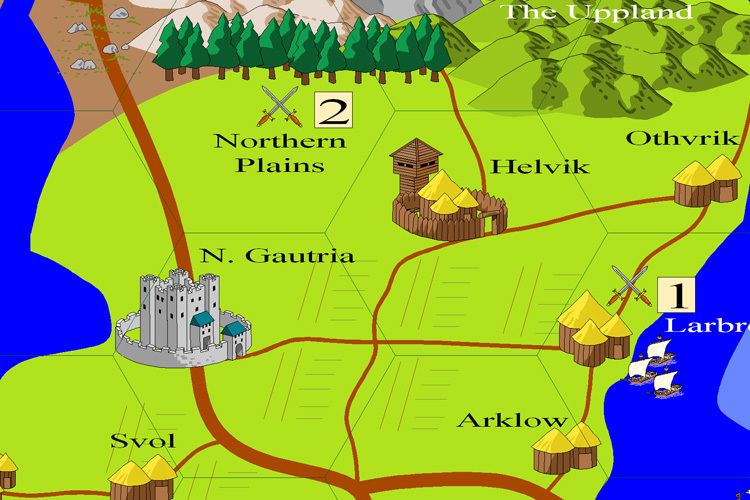 They were attacked en route by a rebellious Great Northern Hertog urog and myself, his unaffiliated urog ally. 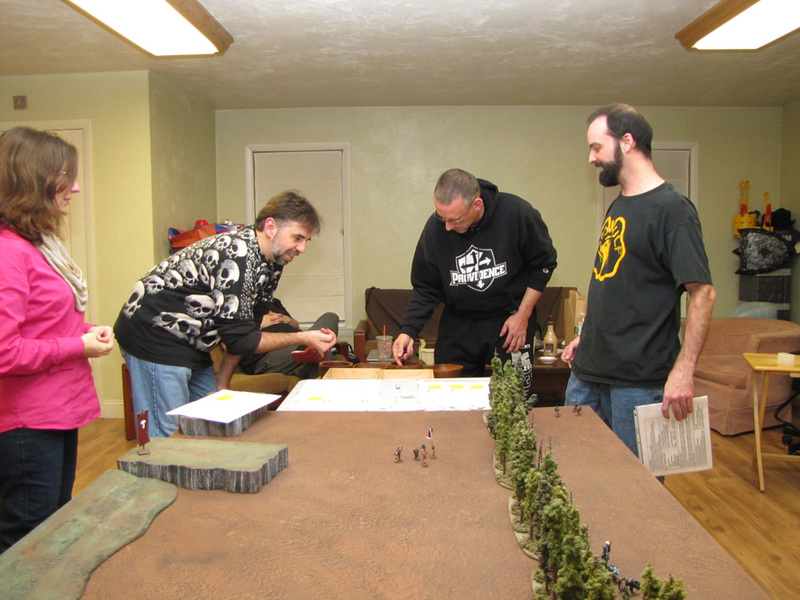 Scouting rolls decided that the League orcs form their units anywhere in the middle 2 foot stretch of the 6-inch-wide road. 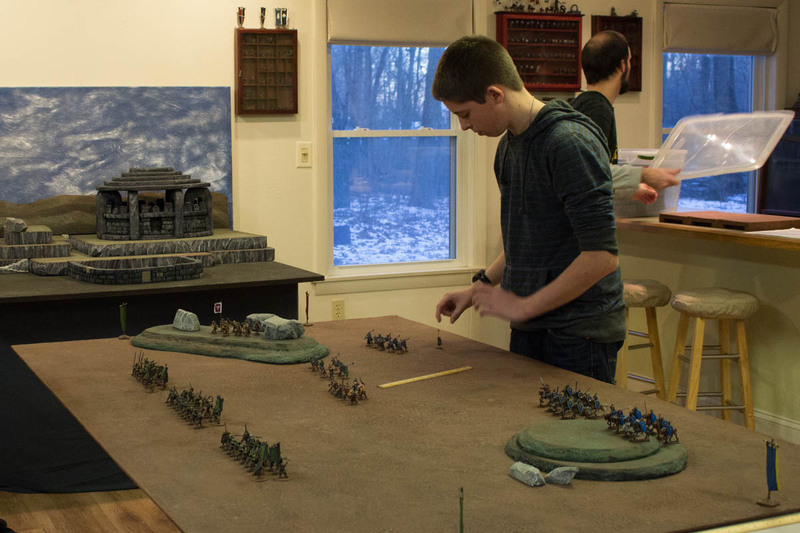 The Great Northern Orcs could deploy no closer than 12 inches to either side of the road. 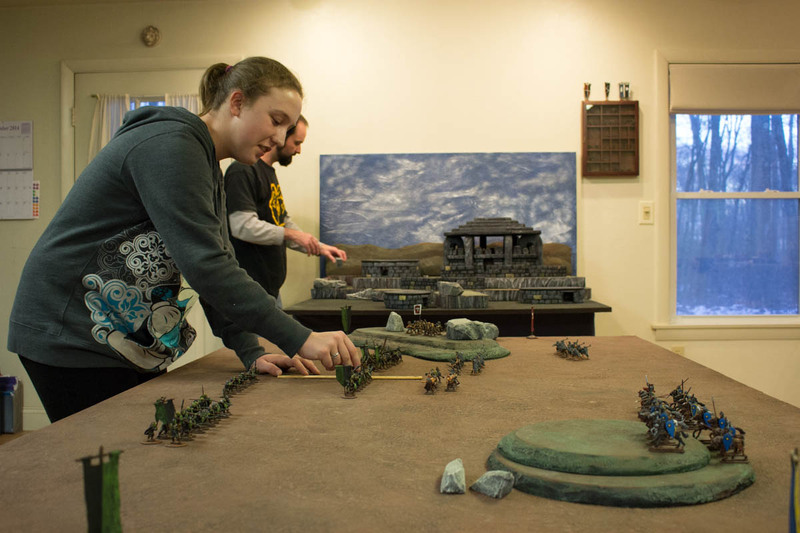 Daughter commanded a unit of elite medium infantry armed with pikes, an elite orc hero, and a unit of veteran smerdi heavy infantry with spears and shields. 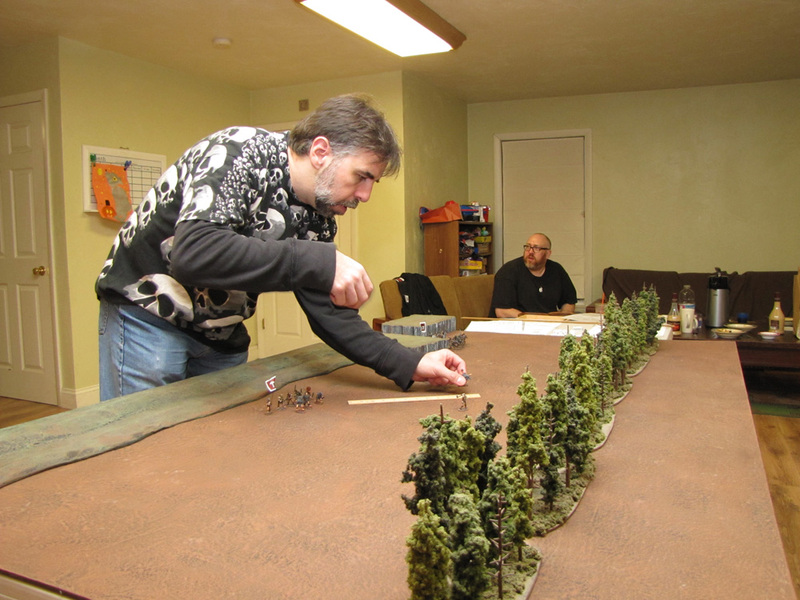 Father played the elite warlord, a unit of veteran medium infantry with swords and shields, and a second unit of veteran smerdi . 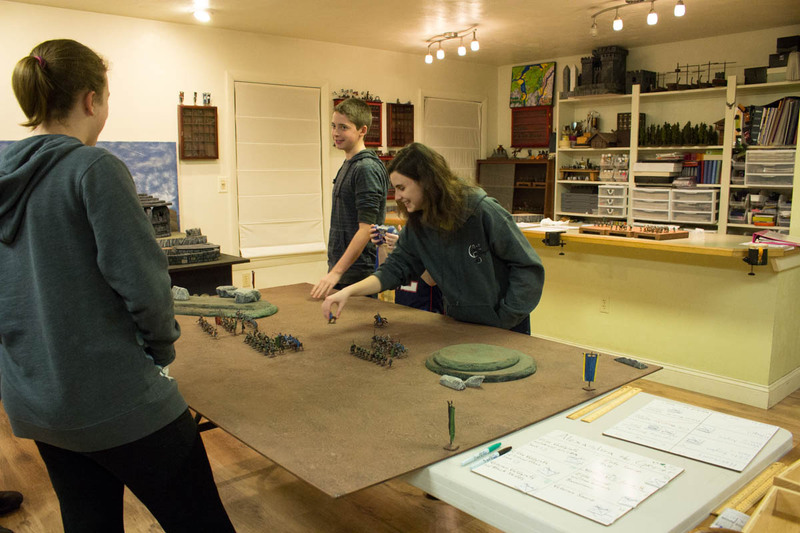 They marched up the road: Daughter’s elite unit and hero in the front, followed by Father’s veteran unit and Warlord, his smerdi, then her smerdi followed. 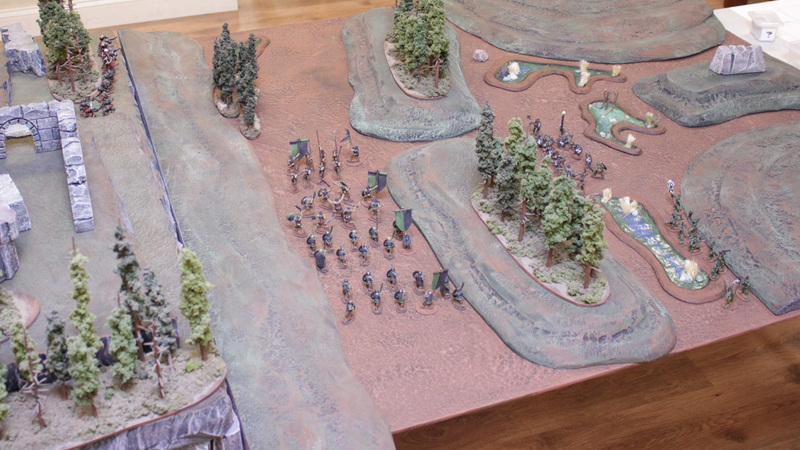 The Great Northern Hertog urog warlord had his units hidden in the woods ahead of the League of Nil-ith Horn column. 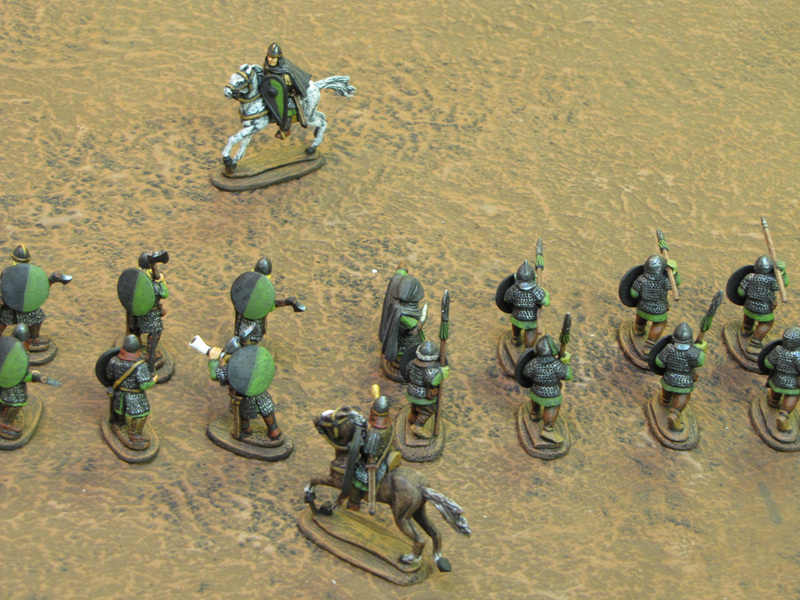 A unit of elite urog valdgrafs with shields and heavy armor fought for the Hertog, along with another urog hero and his unit of orc reavers with 2-handed weapons and medium armor. 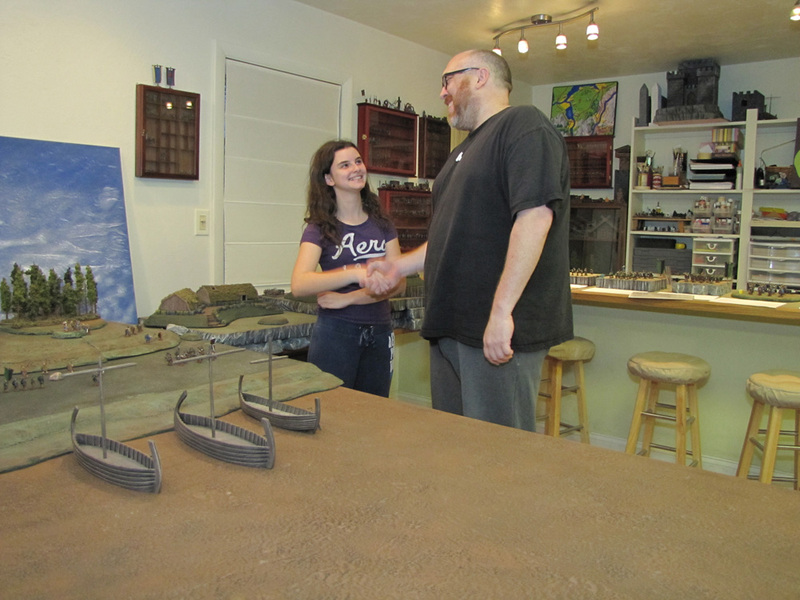 I commanded an urog warlord with a unit of veteran reavers who bore shields and wore heavy armor, and an urog heroine and her unit of elite orc ambushers. 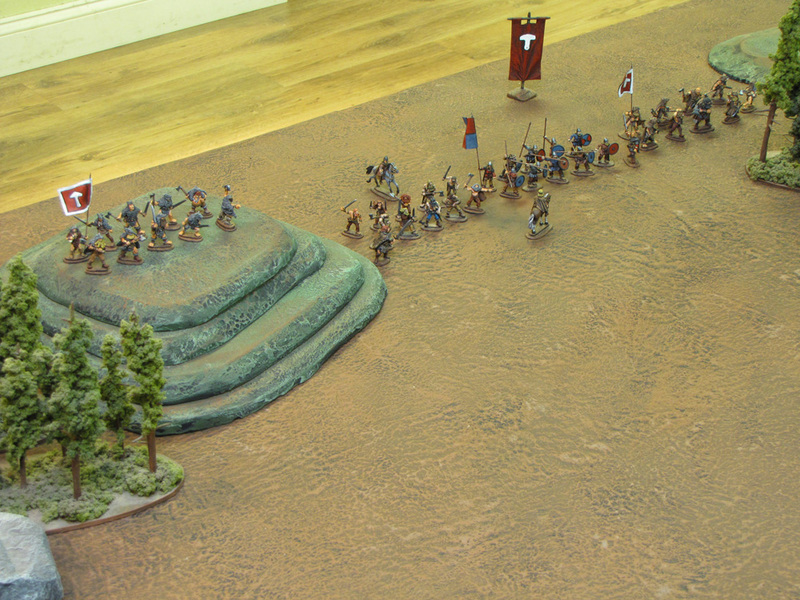 My warlord and reavers climbed the ridge for a more threatening position of the road. 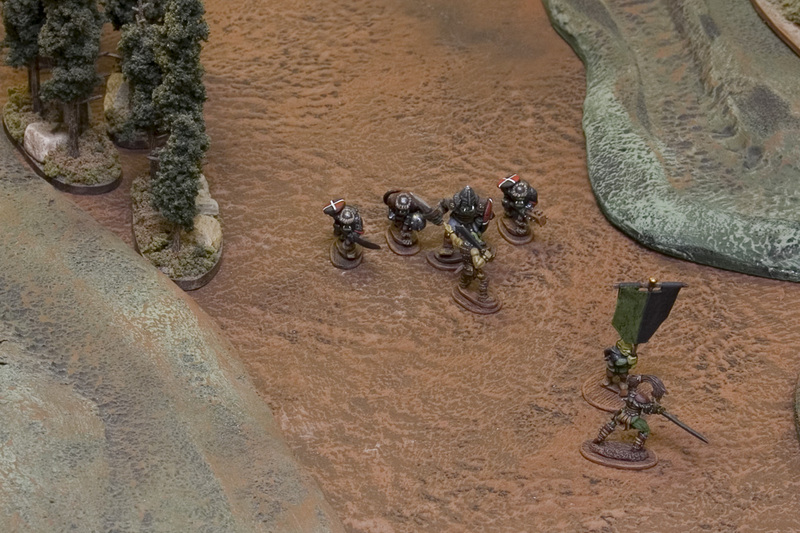 The elite orc ambushers displayed uncanny speed as they and the heroine attacked the unit of smerdi at the rear. 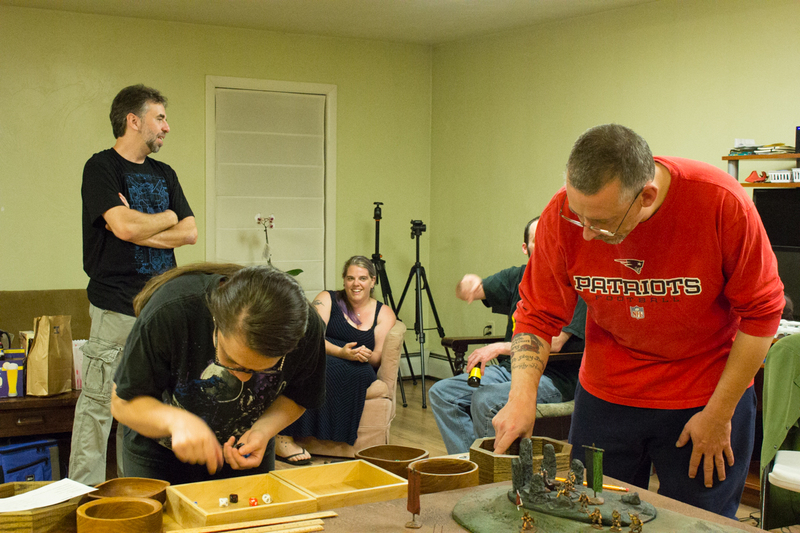 There was a great clash, but few casualties. 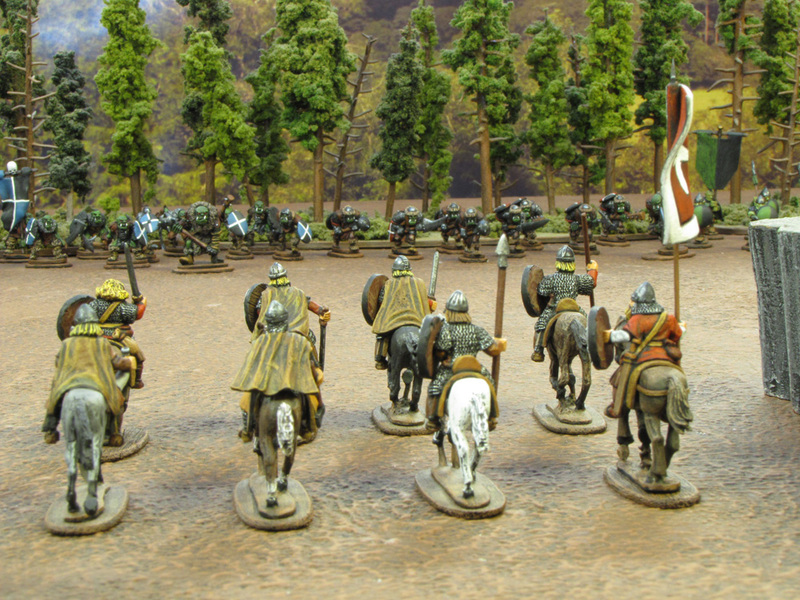 The Hertog brought his unit of elite heavy infantry around the woods and bogs, while he attacked the League of Nil-ith Horn medium unit in the road with his reavers. 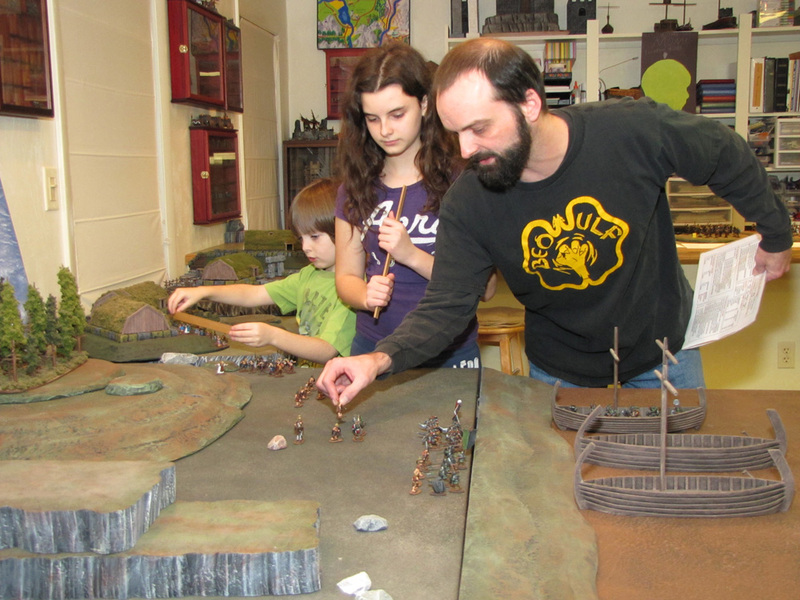 Father answered the reavers in the road with his veteran shield unit, and attacked my reavers on the ridge with his smerdi infantry. 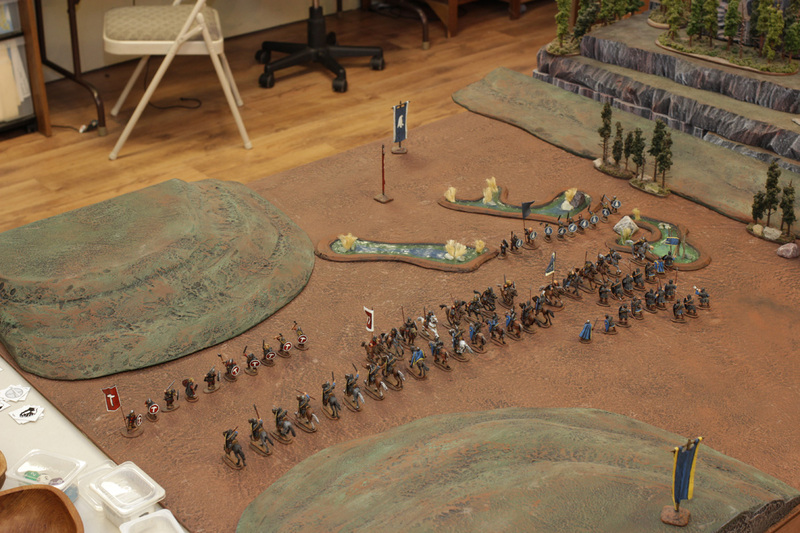 Daughter sent her elite pike unit up the road at the Hertog and his elite heavy infantry. 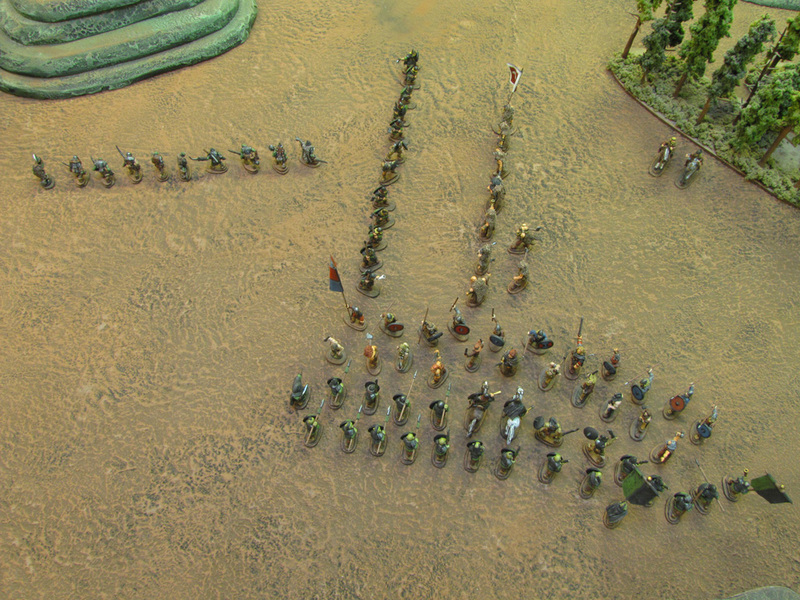 The orcs fought furiously and soldiers began to fall. 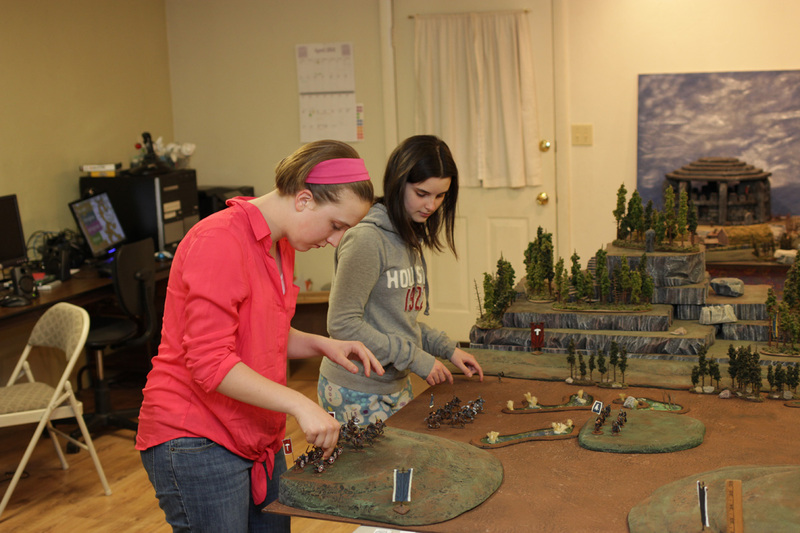 Daughter found her elite unit wiped out quickly, save for the bannerman. 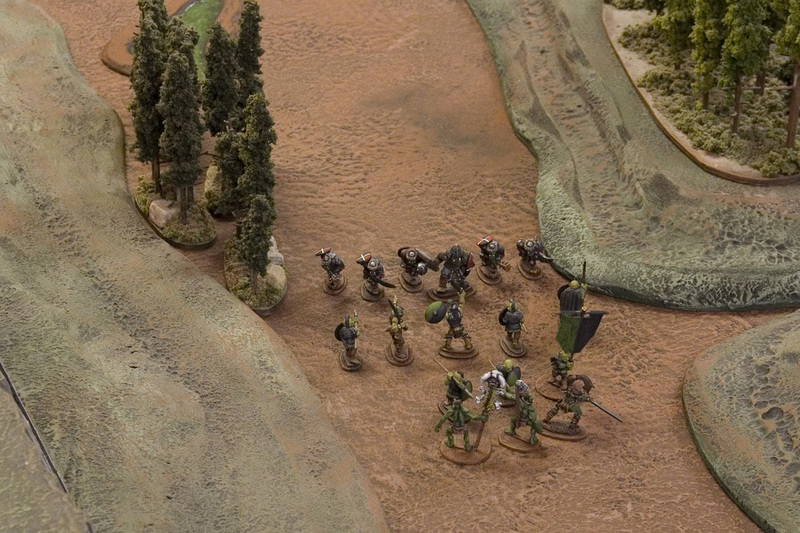 When he fell, the Hertog and his valdgrafs continued down the road towards Father’s unit. 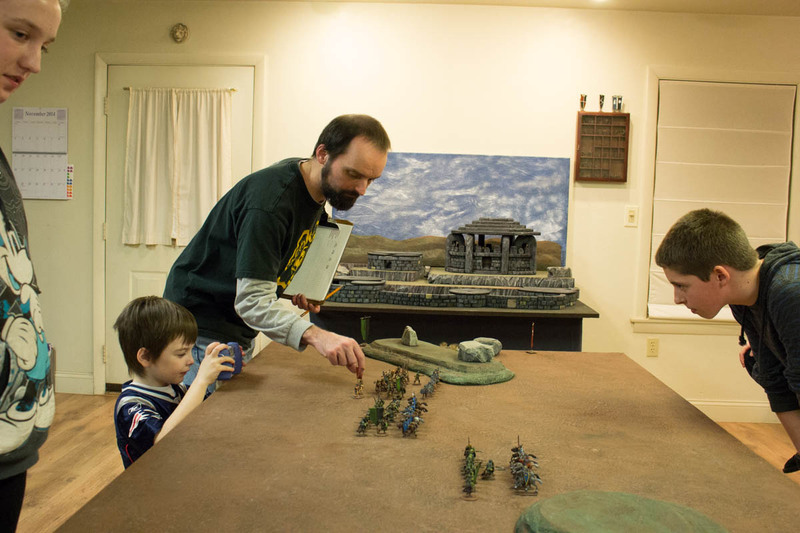 Father’s smerdi proved more efficient killers as they eliminated my reavers on the ridge, then rushed down the hill to support his hand and shield unit. 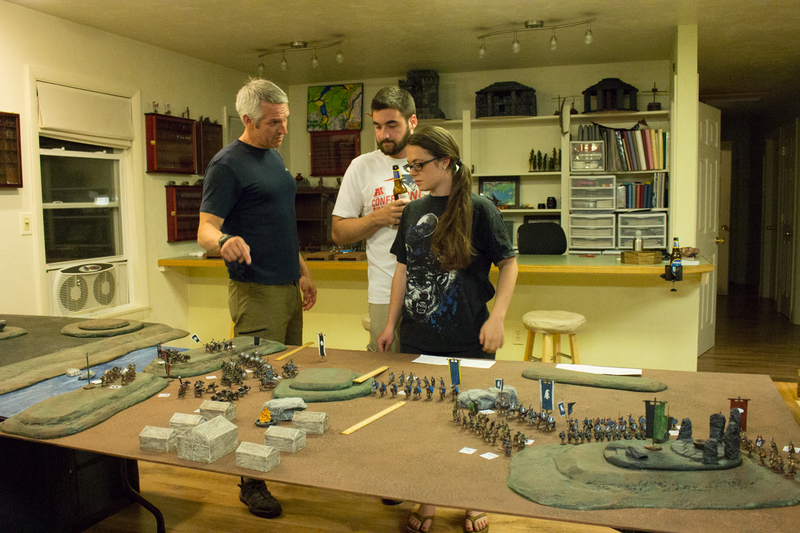 But Daughter’s smerdi were worn down by the savage ambushers and the Great Northern orcs converged on the remaining League of Nil-ith Horn forces. 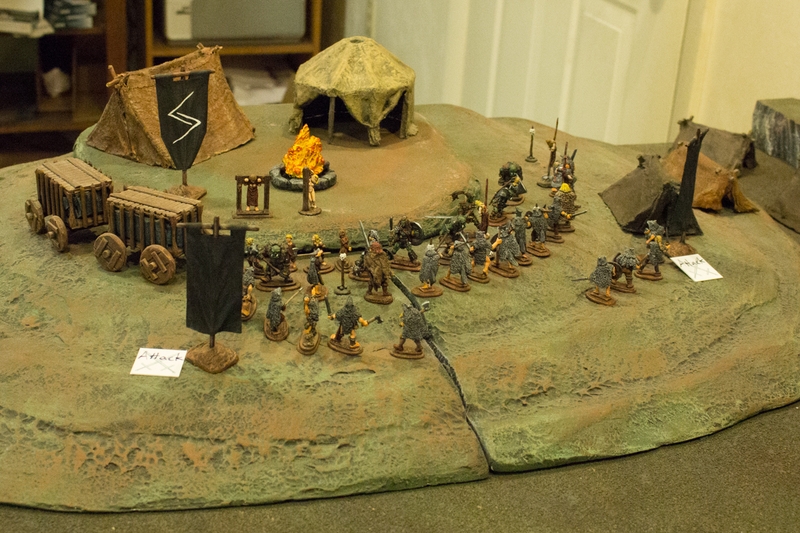 The rebellious Great Northern Orcs slaughtered the League of Nil-ith Horn forces. 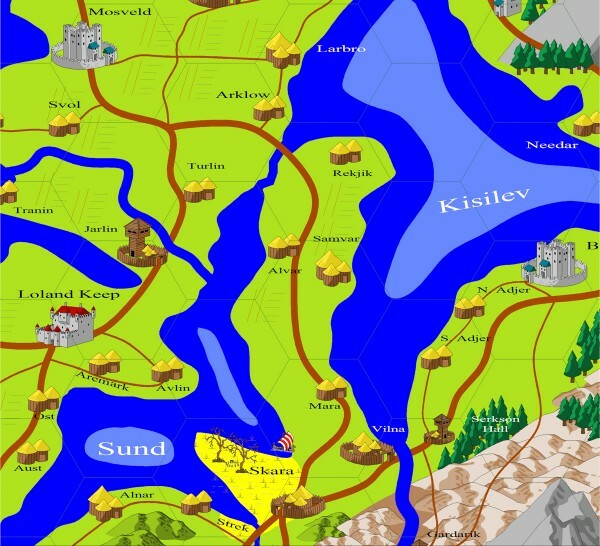 And none of that relief force reached Kednvald. 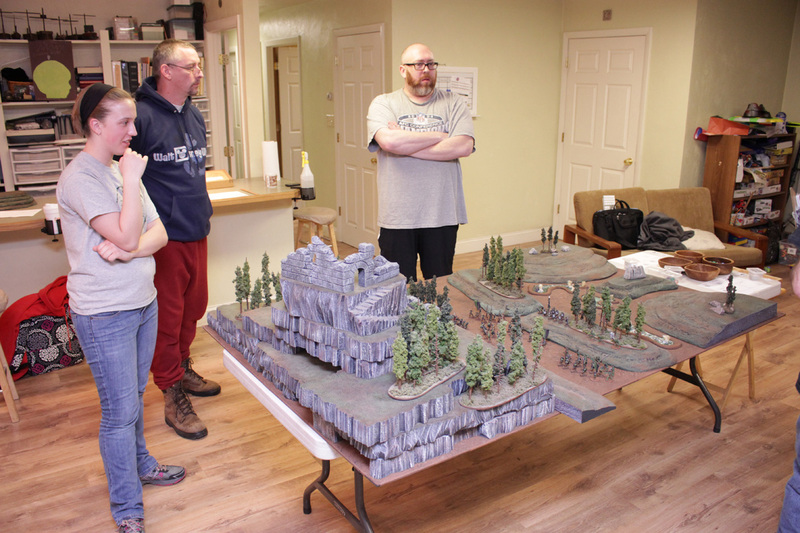 We wanted to play-test some special abilities we’ve been researching/developing to bring mass combat Fantasy Warriors wargaming in line with the Conan D20 rules for RPGing, so we took to the table. 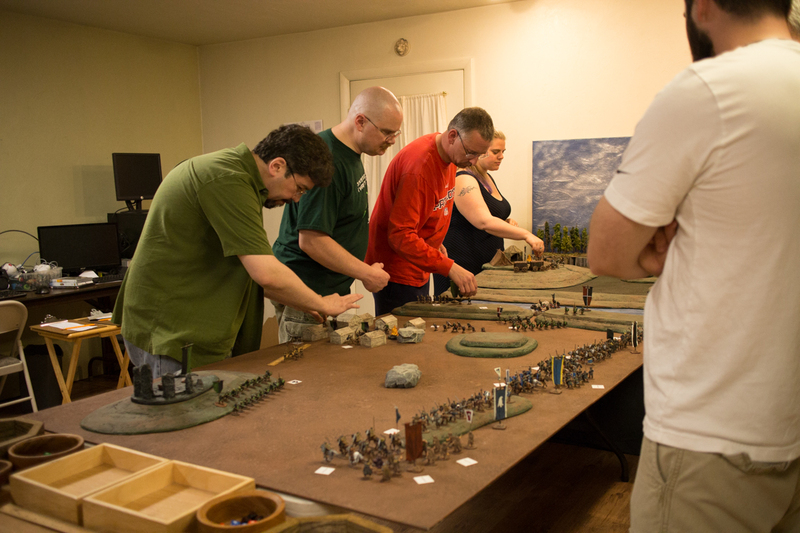 We replayed the battle from Saturday night, with Teshub fighting as the League of Nil-ith horn (mostly) orc forces and myself as the Free Jarls of Gautria. 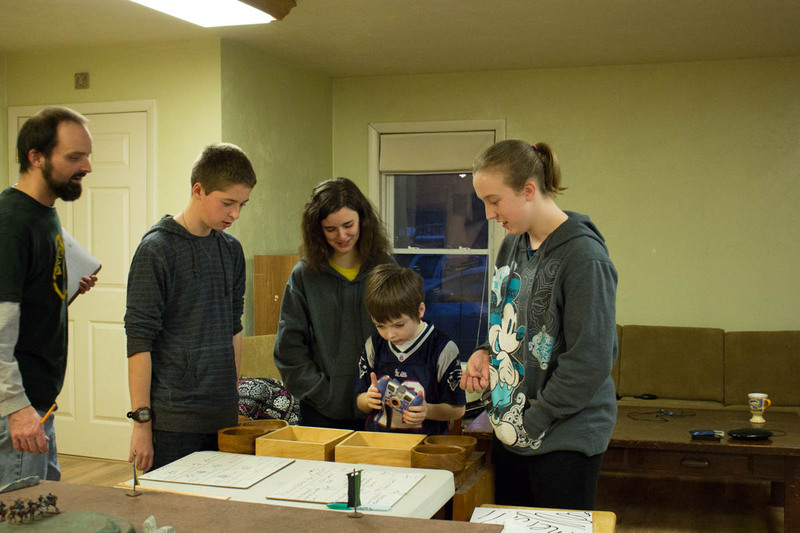 We each picked 2 special abilities (from a list of about 15 that Teshub will type up for me later). 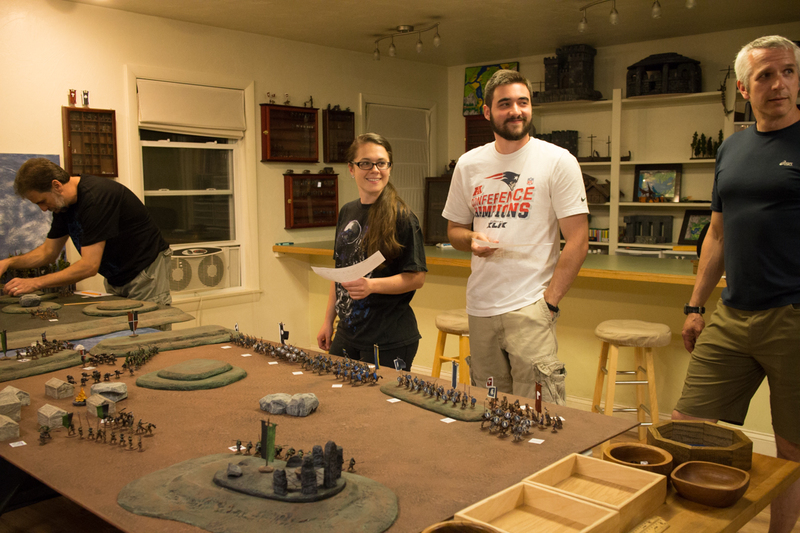 Teshub assigned “Last man standing” to his warlord, making the warlord the last figure removed in a unit, and “Bloodlust” which allowed him to put a unit into bloodlust. 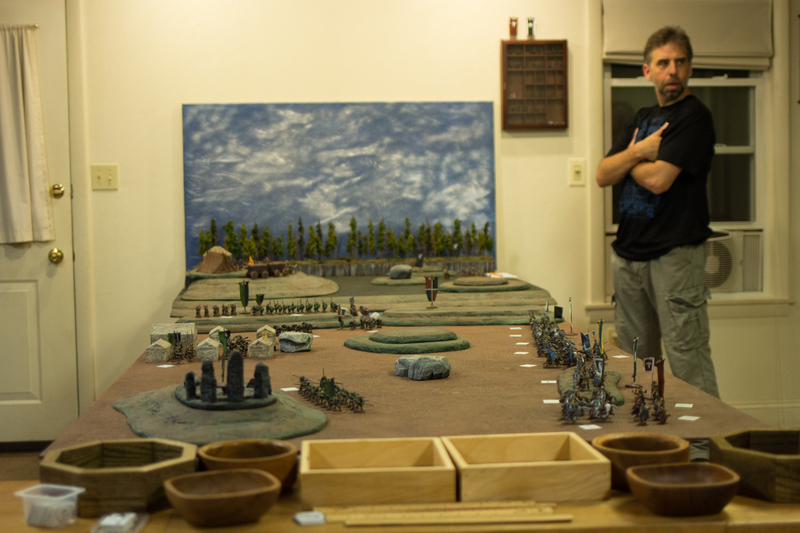 I chose “Diehard” for my leader, adding a +2 to his save, and applied “Legendary Unit” to my berserkers which added +1 attack die for every 3 figures in the unit. 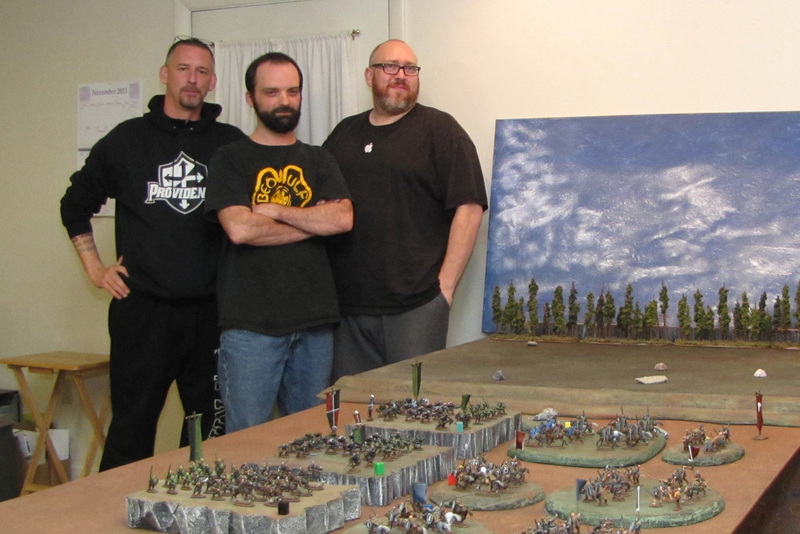 The League of Nil-ith Horn warlord arrayed his 3 units of heavy infantry in the open, with a unit of medium armored Vangen orc mercenaries on his left, and 4 orc heroes to his right. 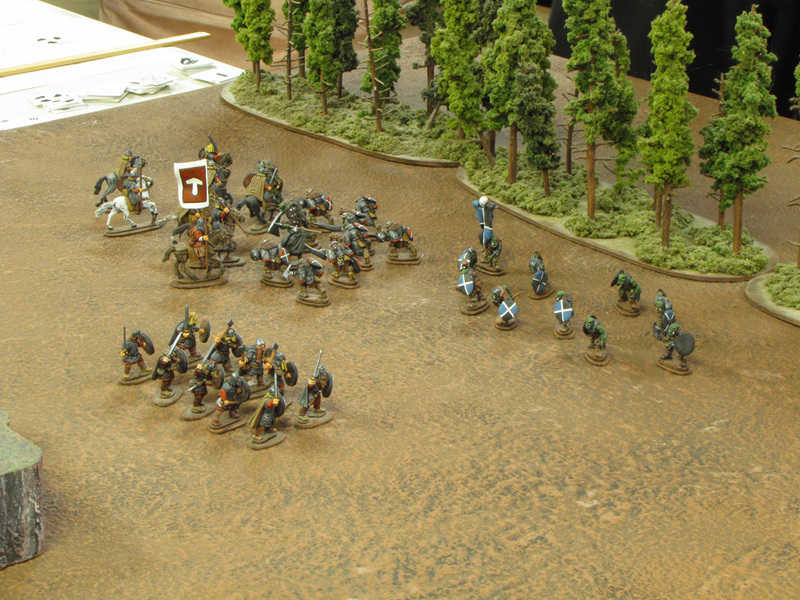 The Gautrian Jarl attempted to use the terrain to the advantage of his more mobile light ulfhednar and berserk units on his flanks, while his 2 slower infantry units kept to the center. 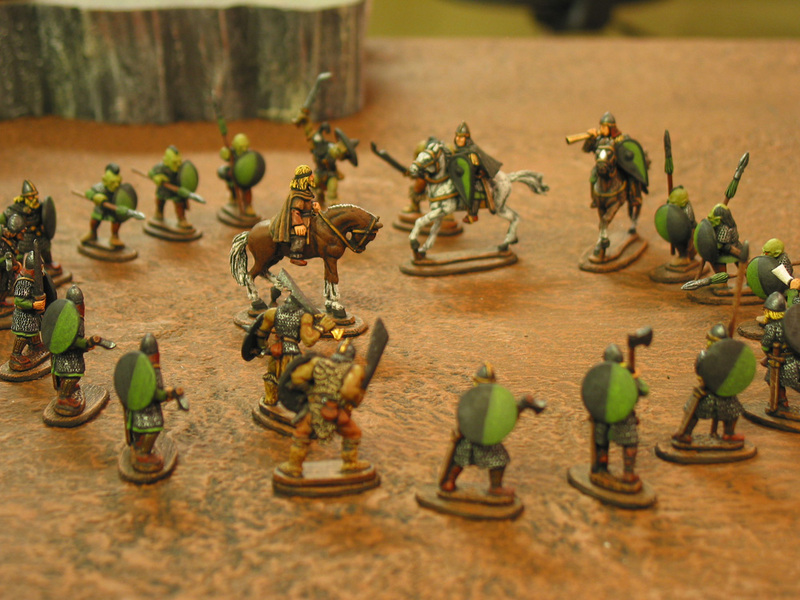 The men of Gautria were bolstered by 2 enormous sword thane heroes and one giant champion. 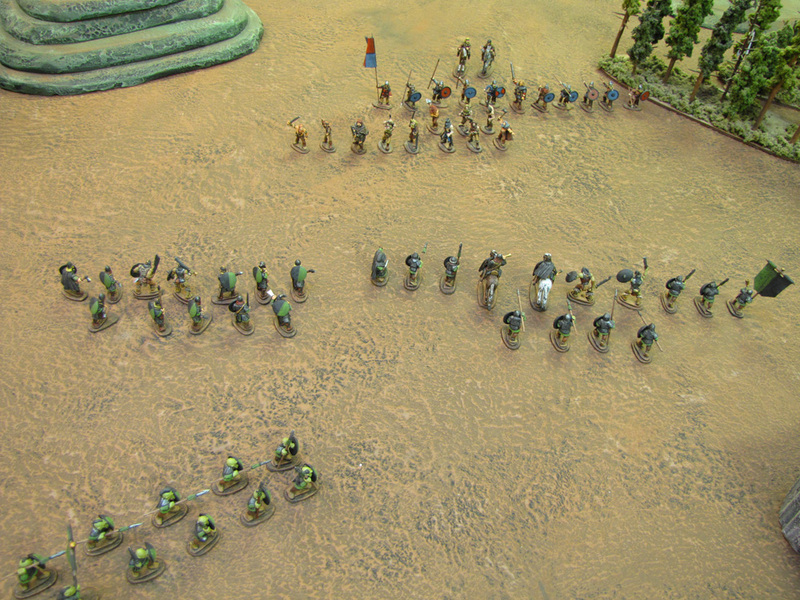 Both leaders looked to stir their troops to victory. 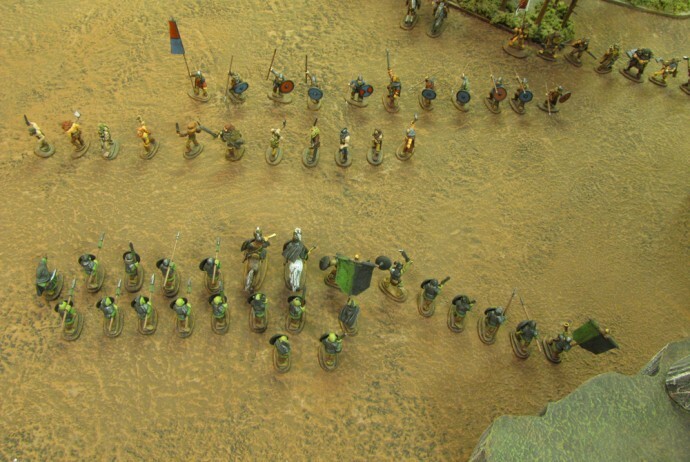 As the League forces began their steady march toward the Gautrian lines, the LNH Warlord drew his 2 Orc spear units together to fight in 2 ranks. 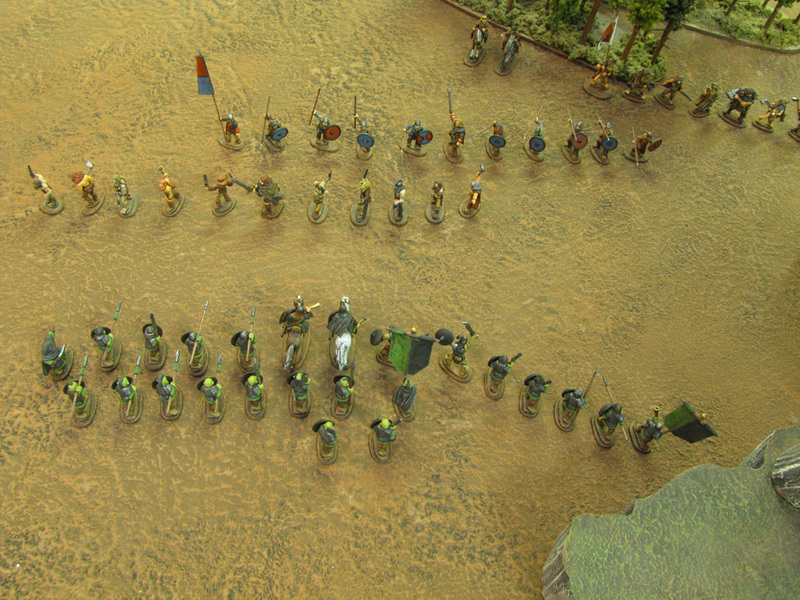 The Gautrian Jarl moved his spearmen into like formation. 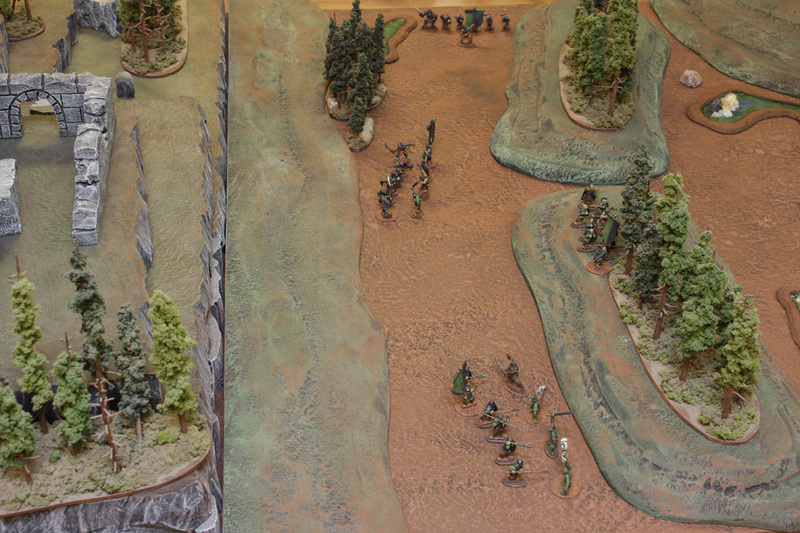 The ulfhednar spread out on his right, and the berserks with their giant hero snuck through the trees on his left. 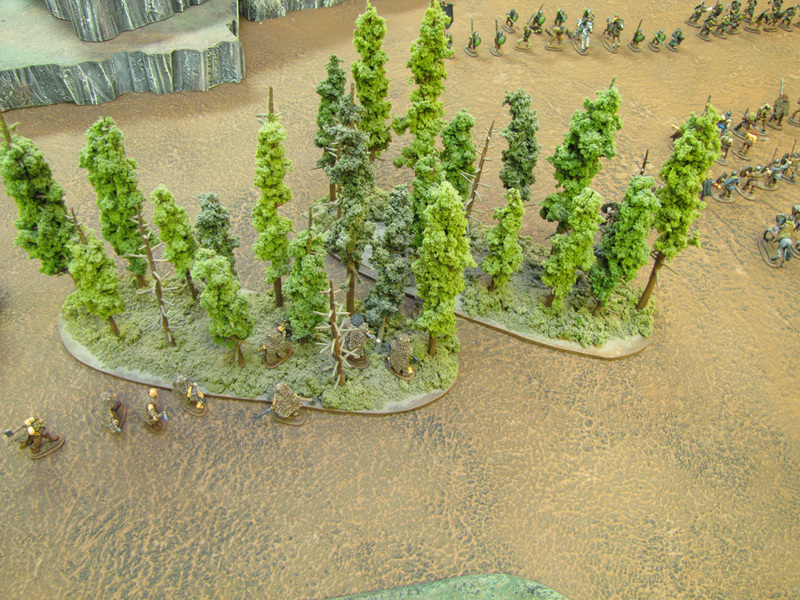 When they emerged from the woods, they saw the opposing phalanxes about to clash. 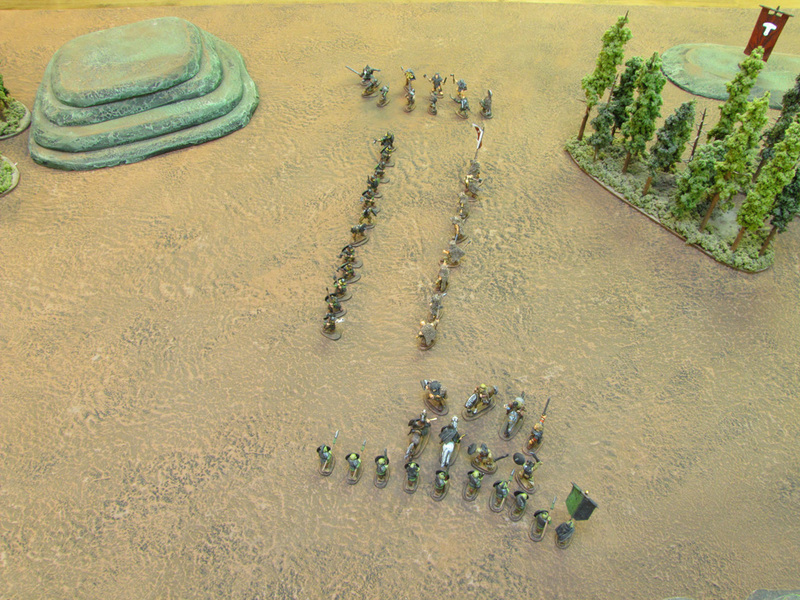 The spear units closed for attack and the bloodshed began. The heavy armor and mighty heroes at the center of the battle proved the difference for the LNH as the Gautrians crumbled. 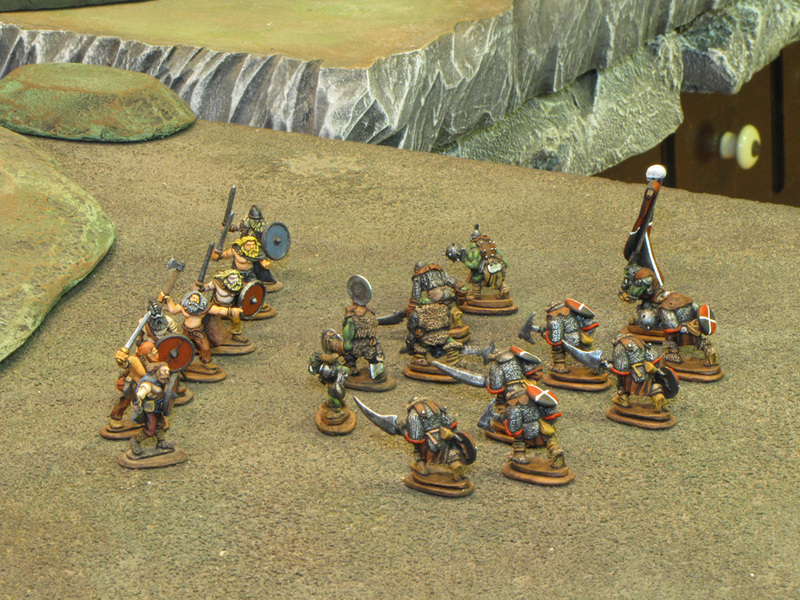 Unable to get his berserks into attack orders, the Jarl took his remaining heroes and plunged into the fray. 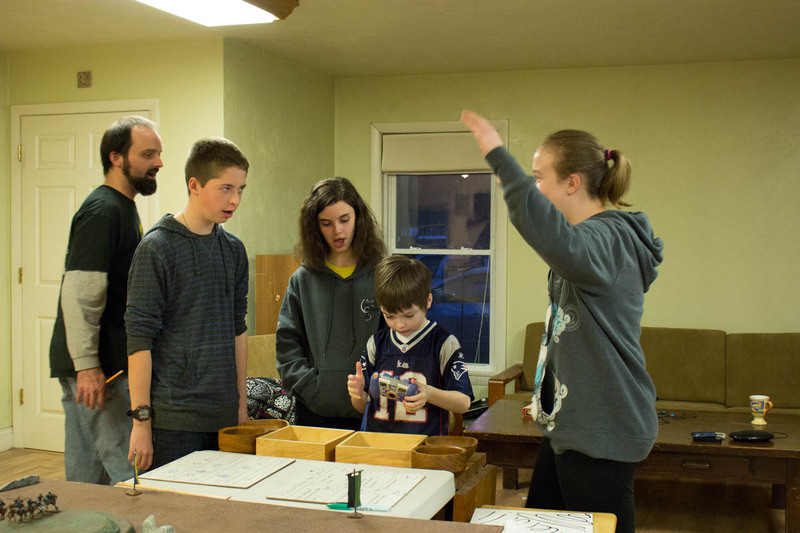 Seeing the fierce human berserks confused and holding their ground, the LNH Warlord refused battle there. 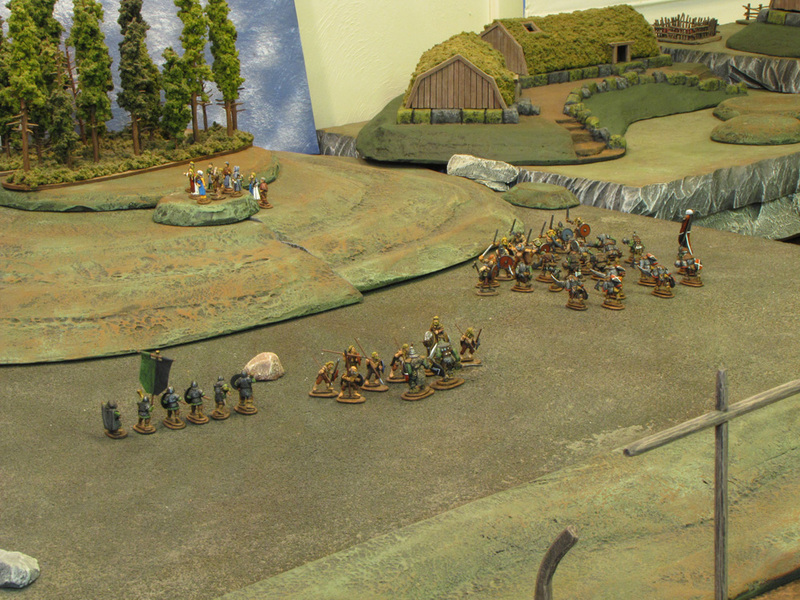 The Ulfhednar moved in to strike so the Vangen mercenaries were thrown into Bloodlust by their unit leader. 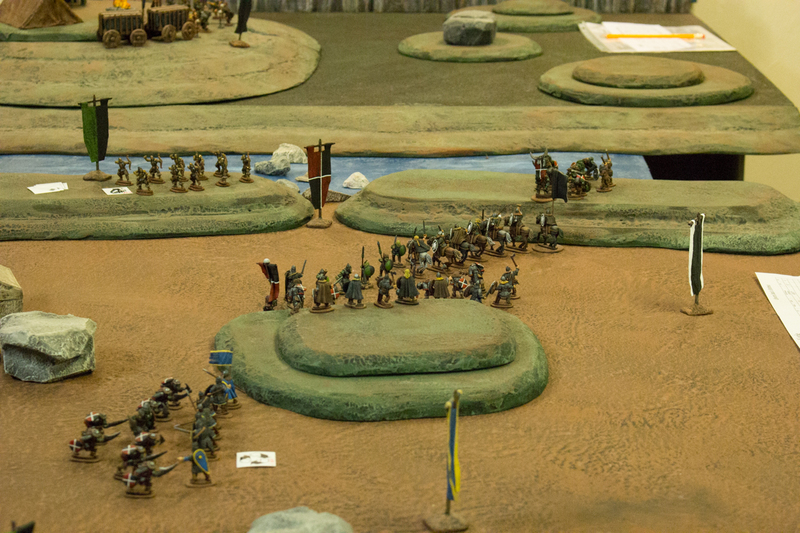 Enraged, the orcs savaged the Ulfhednar and annihilated the men in a single round. 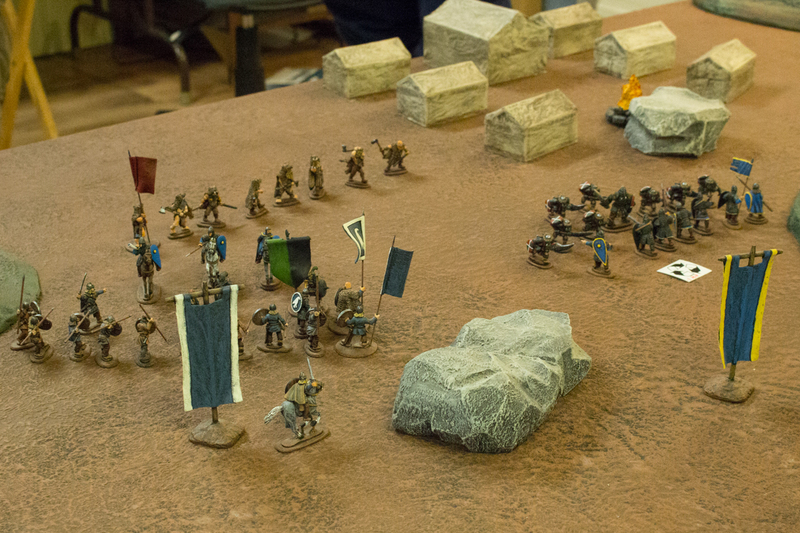 Now blood drunk, the crazed orcs slammed into the Gautrians finest unit, the Berserks! 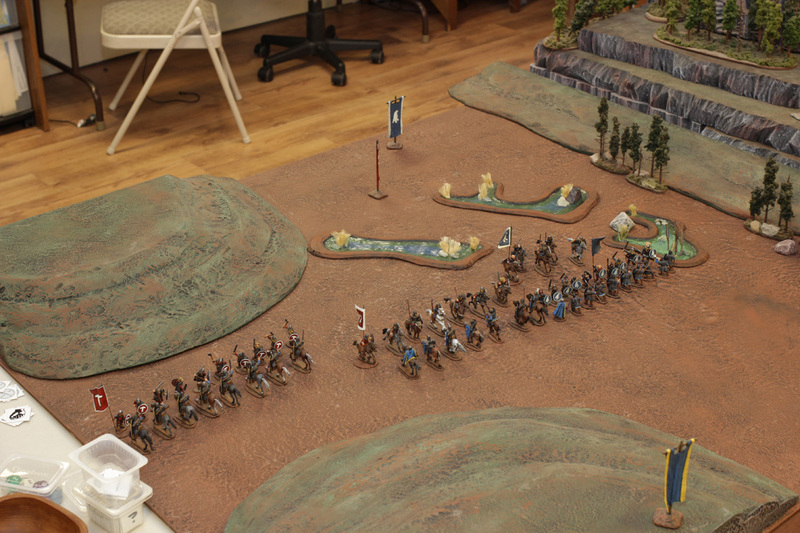 On both sides there was great carnage and loss of life as the two units annihilated each other in the flash of two handed weapons. 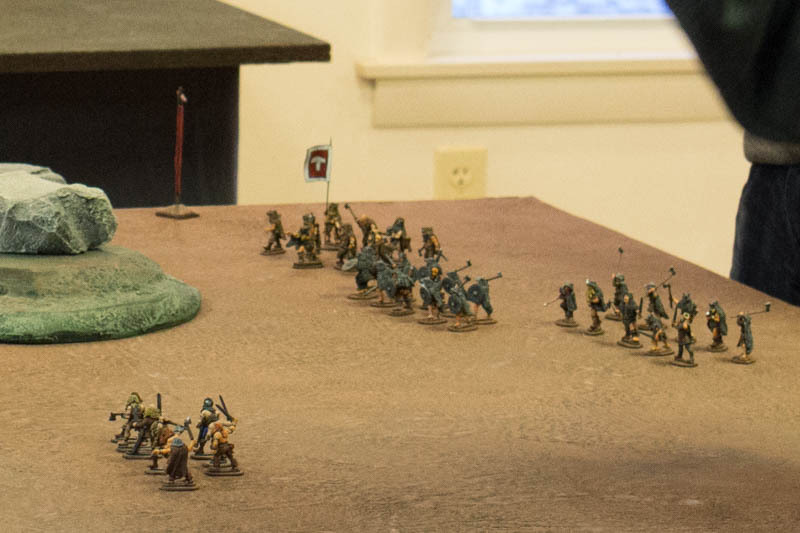 Alone and outnumbered the Gautrian had no choice but to surrender to the League of Nil-ith Horn Warlord. 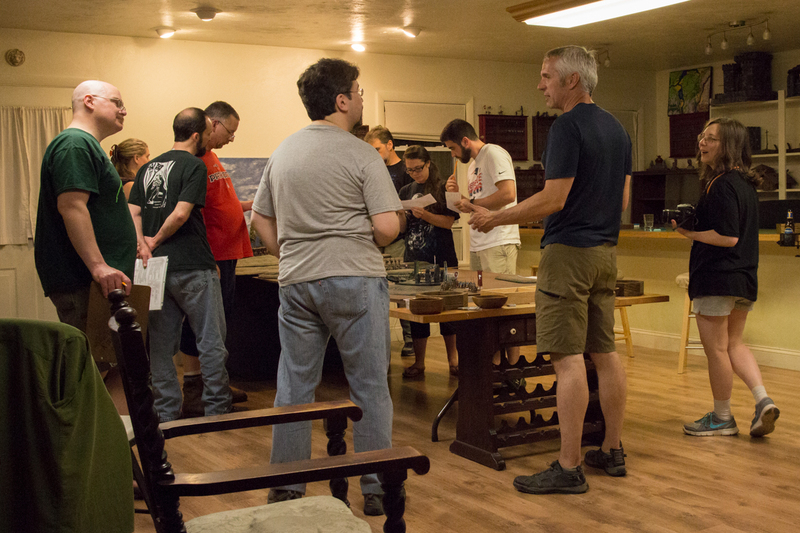 The men of North Gautria gathered outside the town of Turlin to meet the massed forces from the League of Nil-ith Horn. 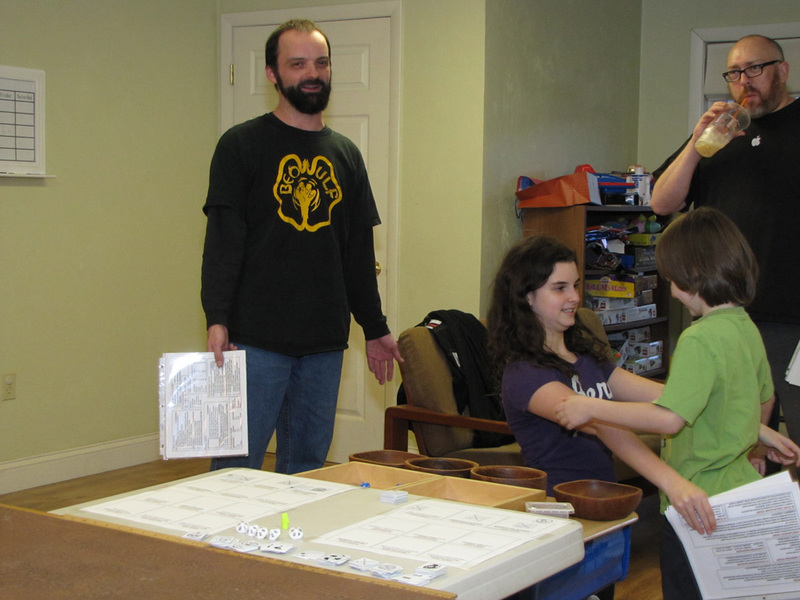 For this battle, my husband did double duty as referee and bad guy. 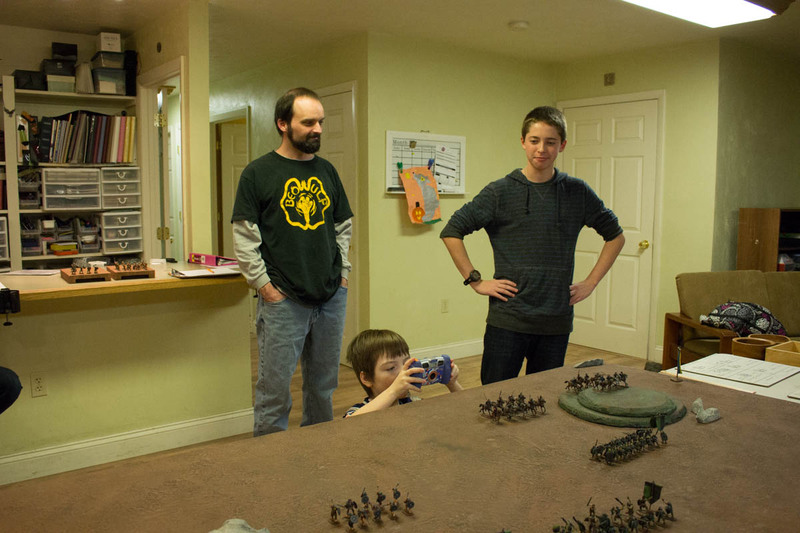 He joined the League’s side and played the Grunevaldians with their elite heavy cavalry, a unit of elite heavy infantry Gautrian Guardsmen, and a unit of orc heavy infantry. 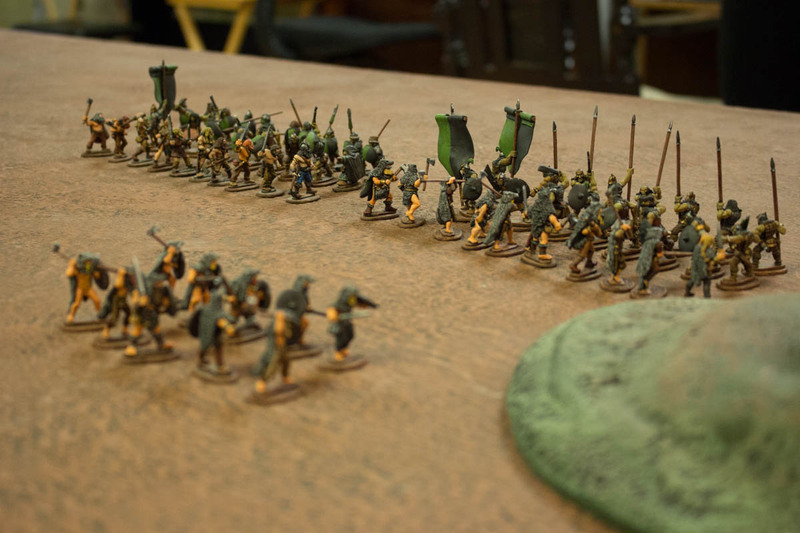 His compatriots kept their armies from their earlier encounters of the event; Graf Stukkin with his three units of heavy orc infantry, and Alarun with two units of heavy and one medium infantry. 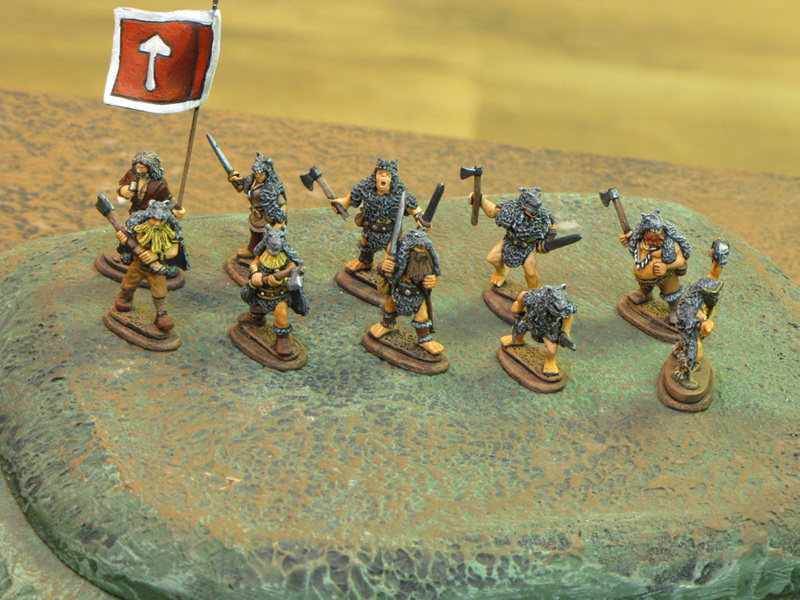 Each had two urog heroes as well. 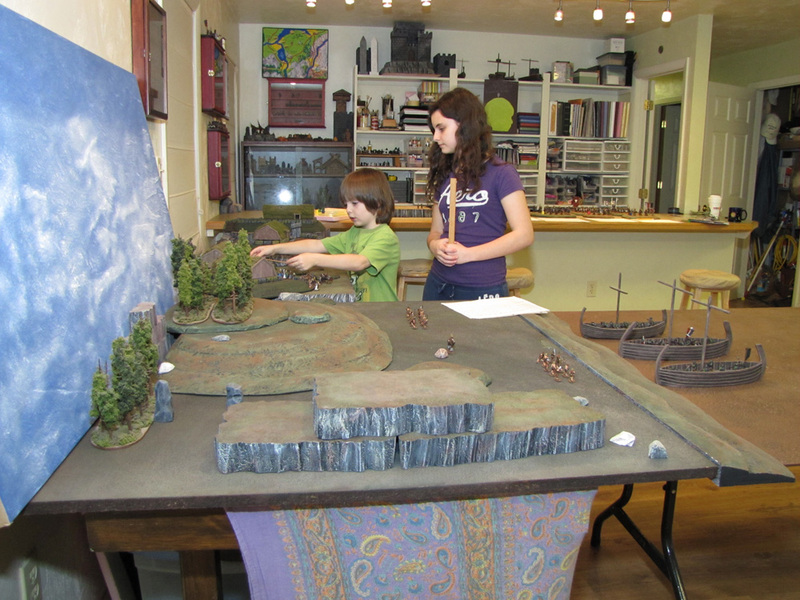 Bleddyn and I shared command of the North Gautrian army. 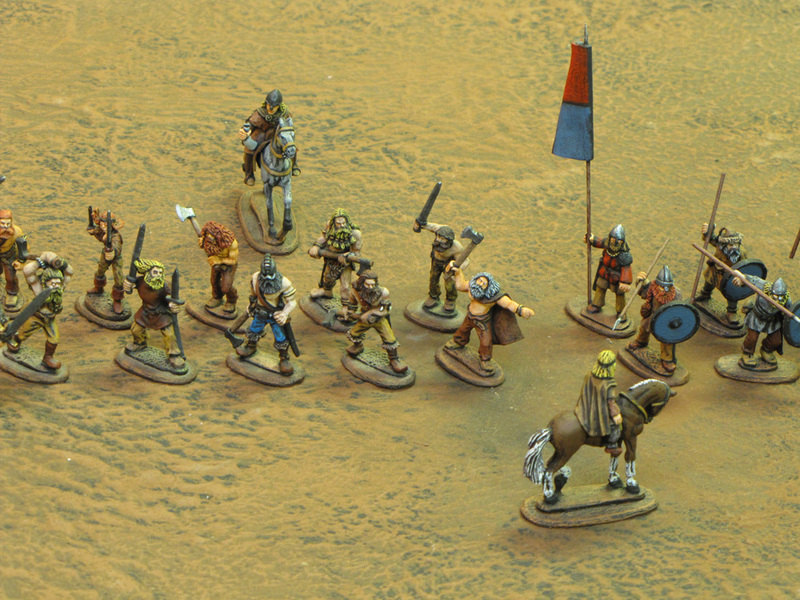 Bleddyn took the King’s elite cavalry and elite heavy infantry, a unit of light infantry, and a unit of light ulfhednar. 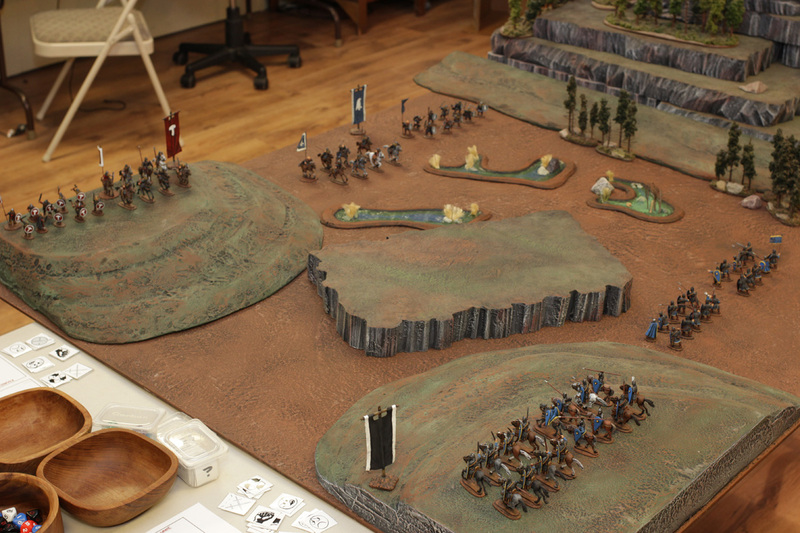 I played 3 units of heavy cavalry, and one heavy and one light infantry. 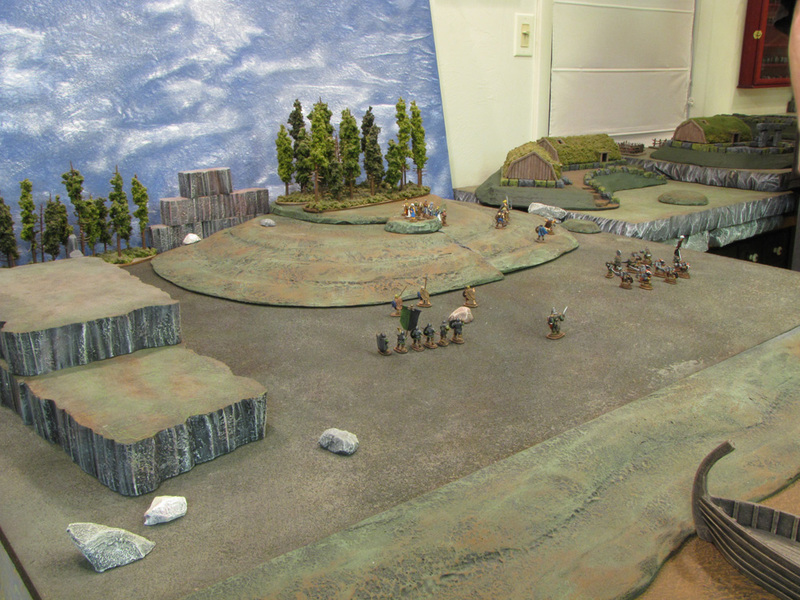 The League of Nil-ith Horn carefully plotted their strategy, while Jarl Kvig provided a morale boost to the Gautrians. 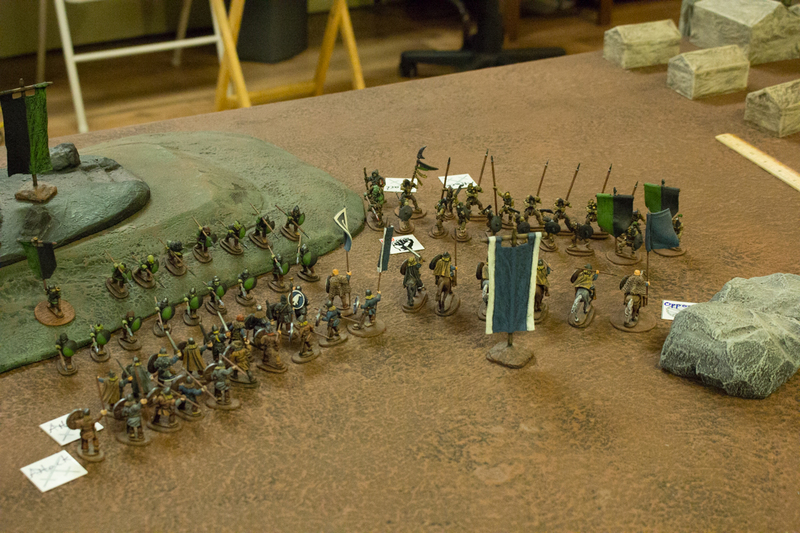 On the hilltop against the forest wall, Jarl Skalla Grimmson’s light bondi eagerly closed with the League of Nil-ith Horn heavy infantry elite Gautrian Guardsmen. 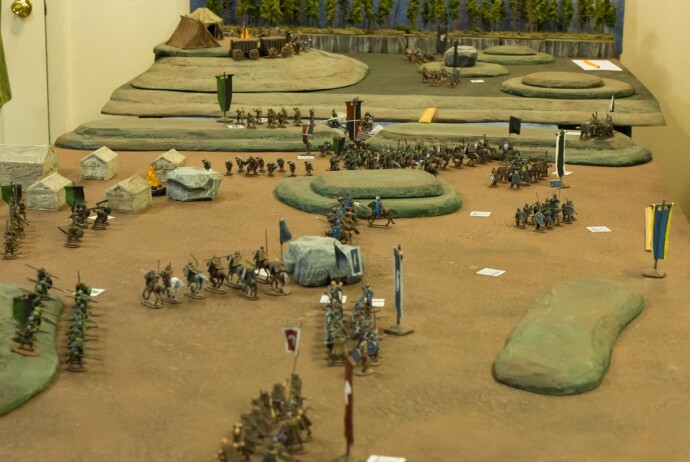 The bondi took high casualties and routed in the first combat round, which allowed the Gautrian Guardsmen to rush forward and pin Skalla’s cavalry in the next round. 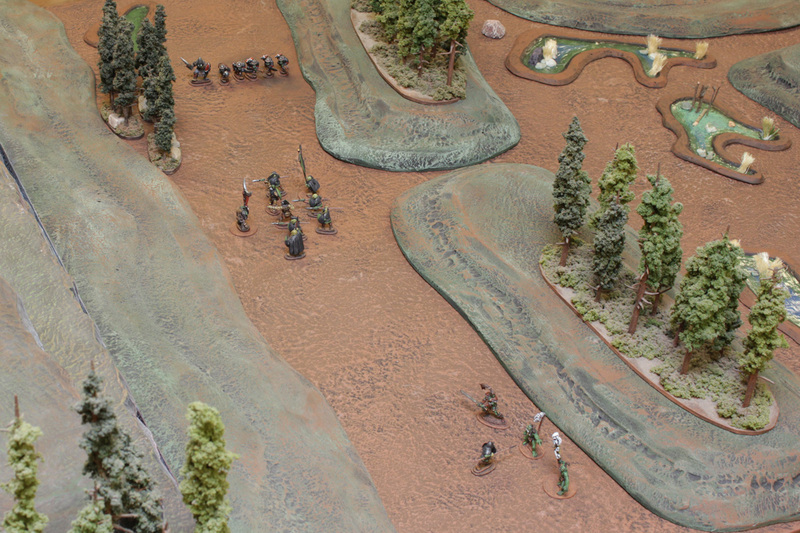 Adjacent to them, the two heavy infantry units of blue and green clash. 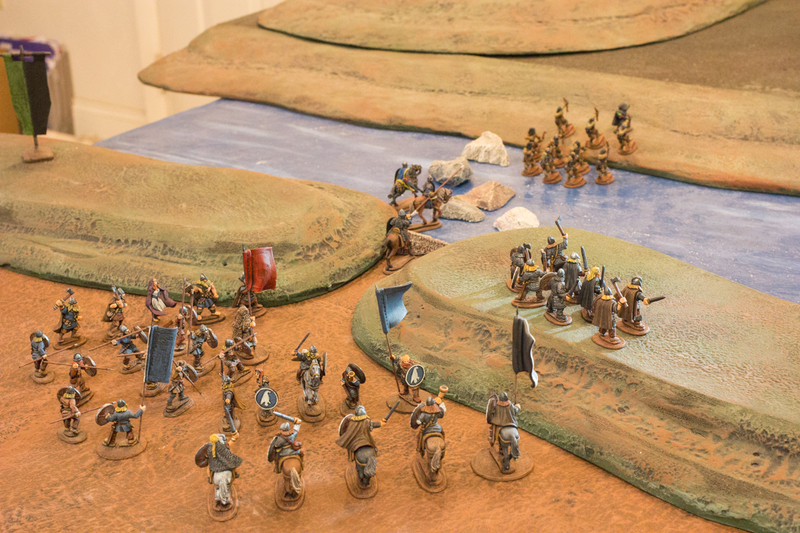 Poor rolling prevented the cavalry from taking down many orcs, while the League of Nil-ith Horn forces were able to rout a second unit of Gautrian infantry, also in the first round. 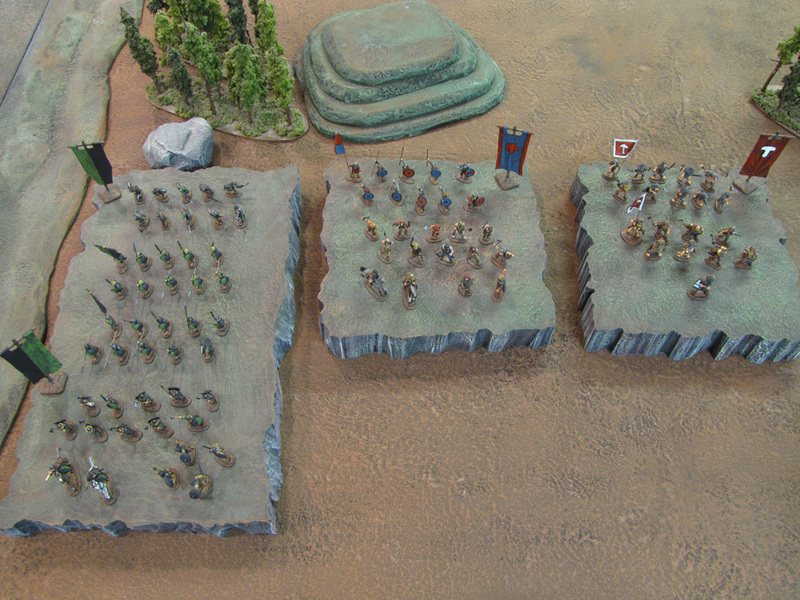 Gautrians fell on the field at every combat roll. 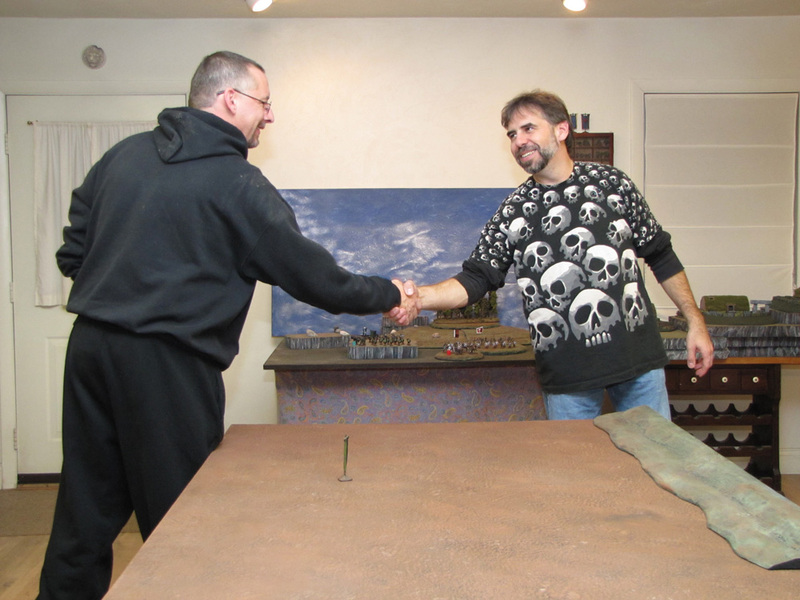 King Gorm himself was lost to an urog’s sword. 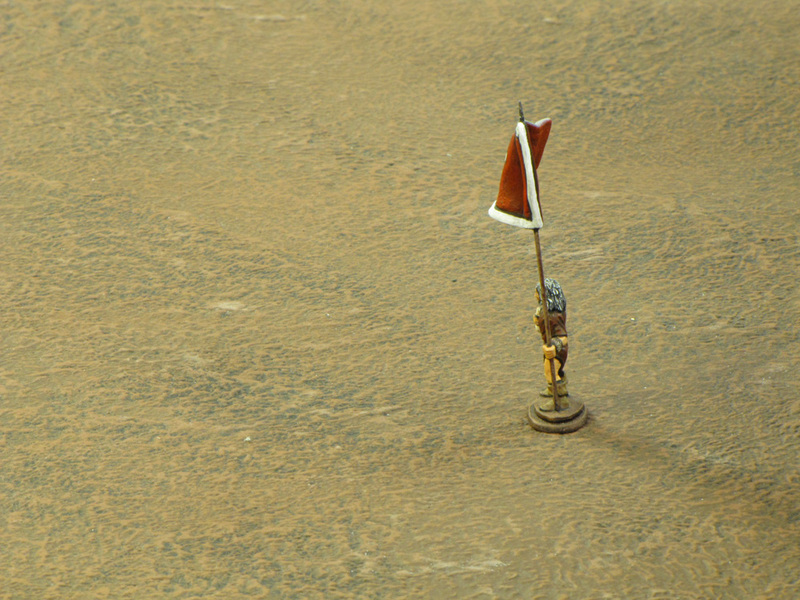 It seemed the gods were not with the Gautrians this day. 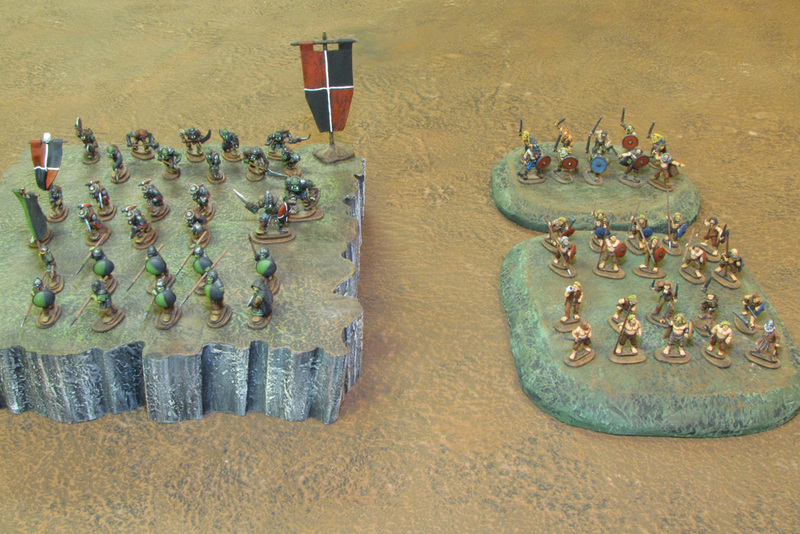 Jarl Skalla’s heavy troops battled on, but the last orc units were closing on them. 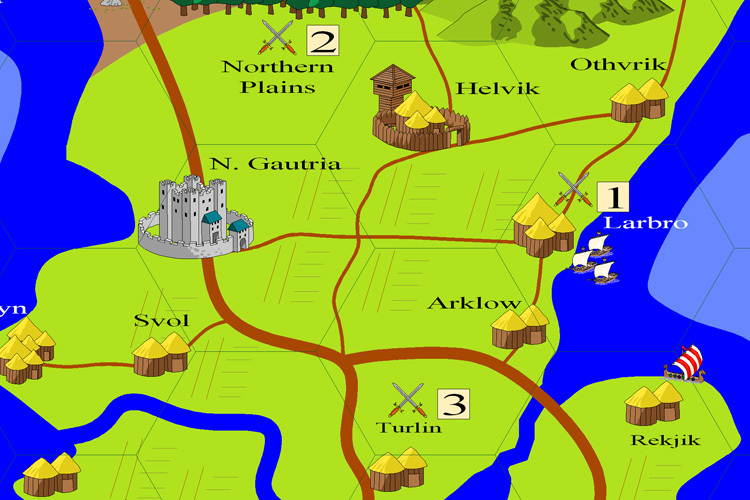 With the odds overwhelmingly against him, Jarl Skalla took his cavalry and fled south to his keep in Jarlin. 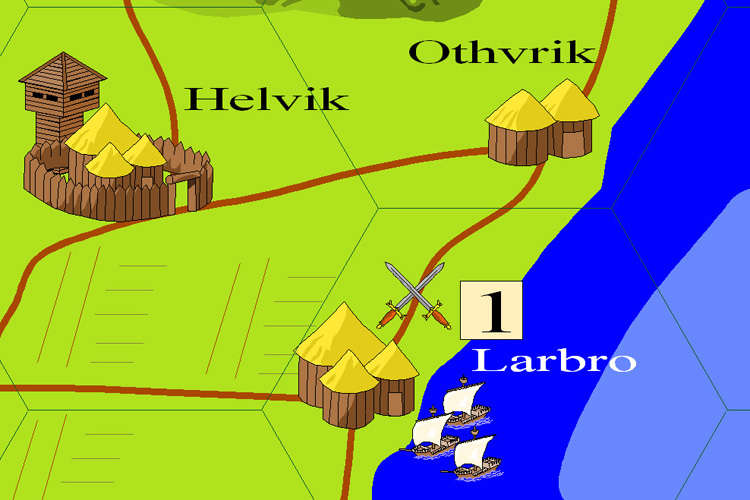 By days end the League of Nil-ith Horn army had won a decisive victory at Turlin and were later able to establish a winter camp and beachhead on the coast at Larbro.